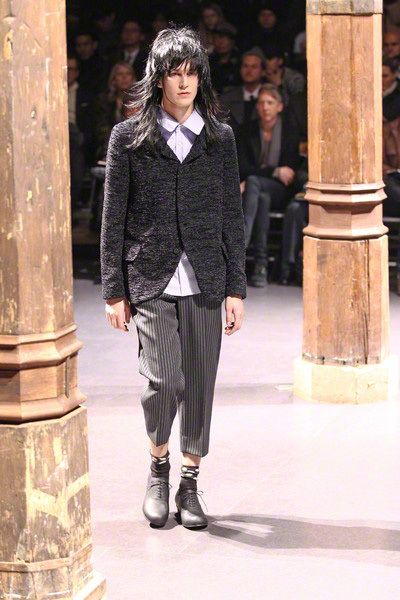 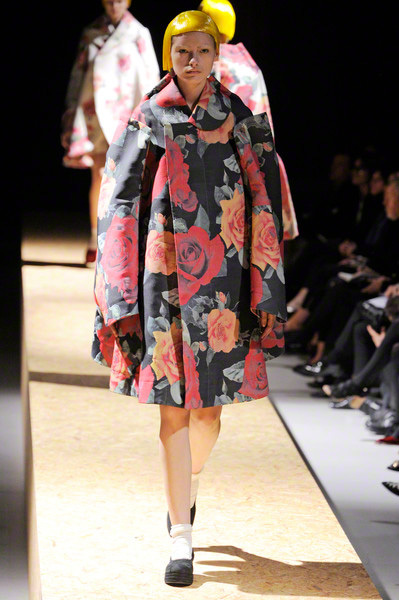 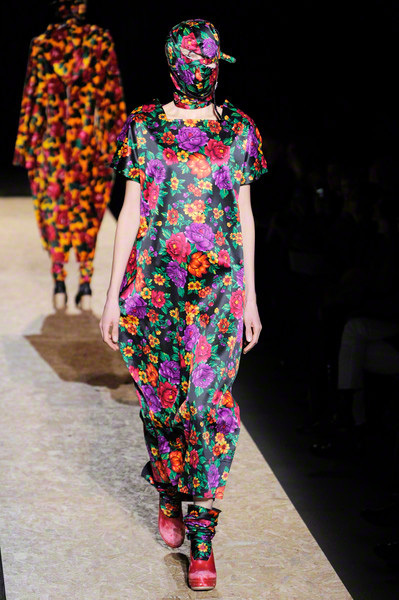 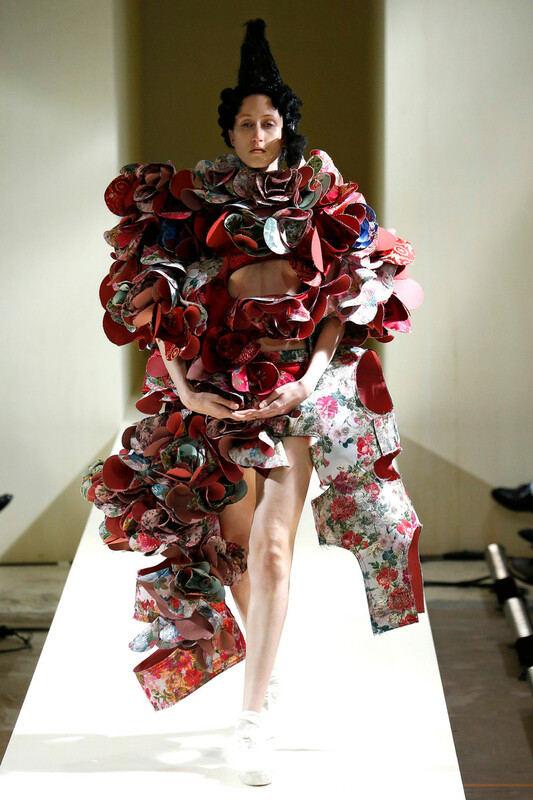 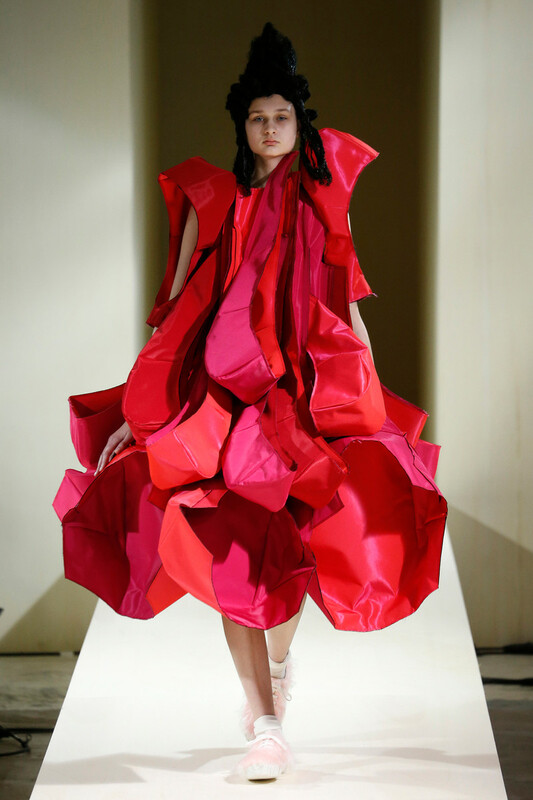 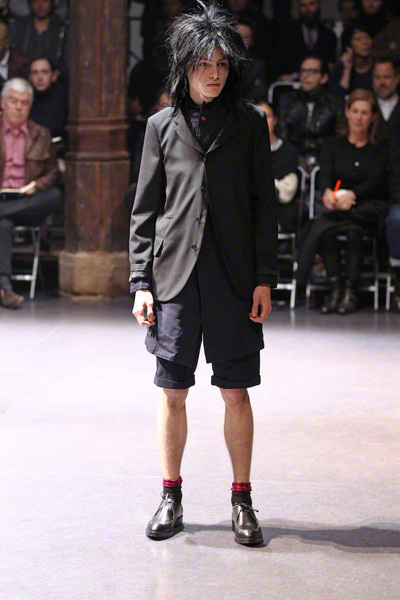 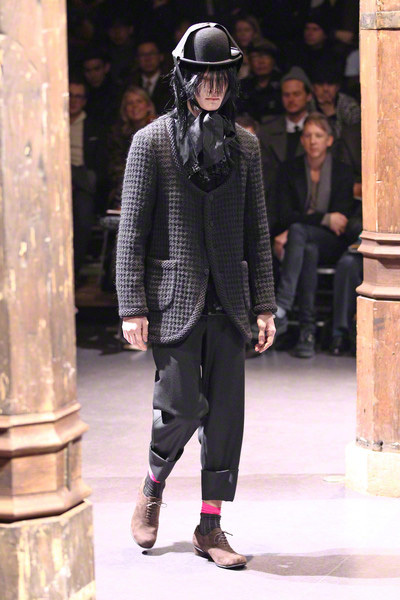 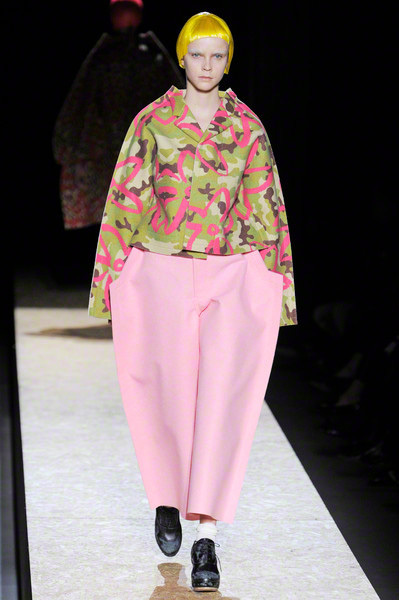 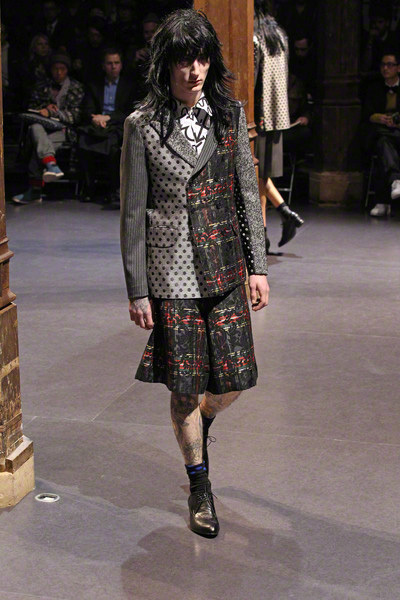 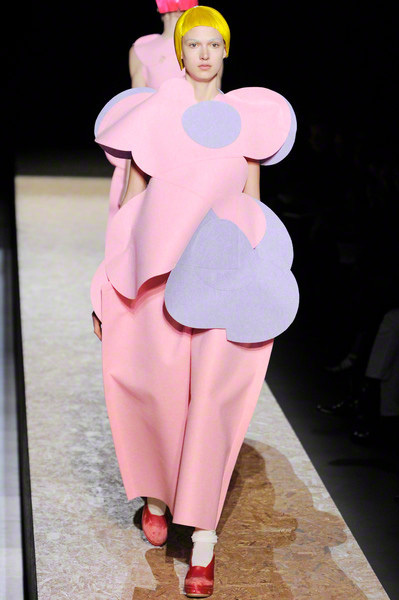 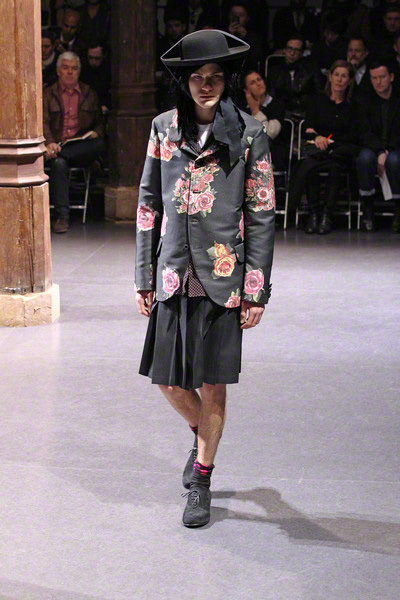 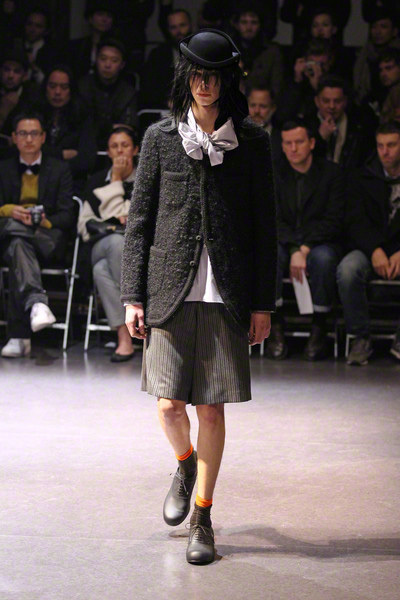 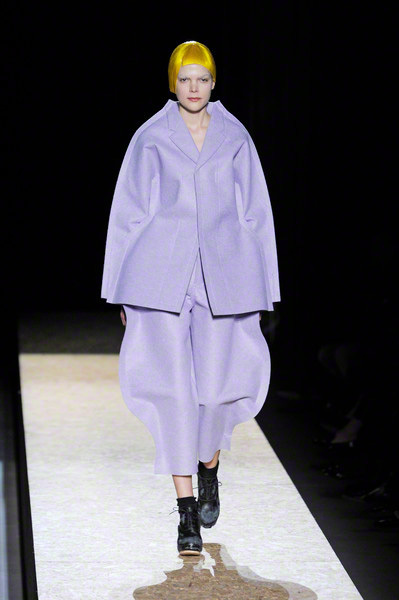 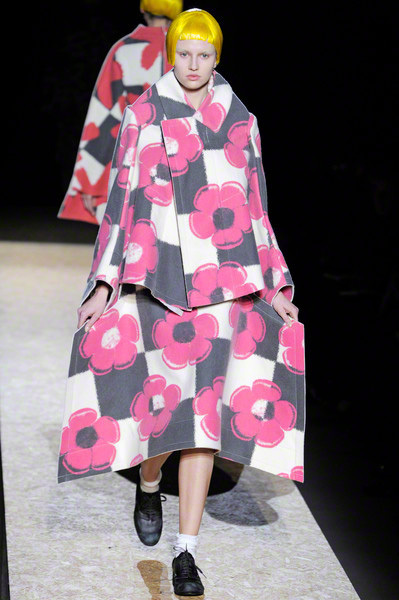 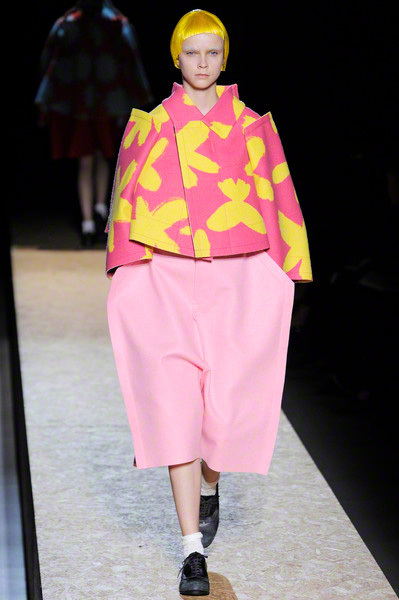 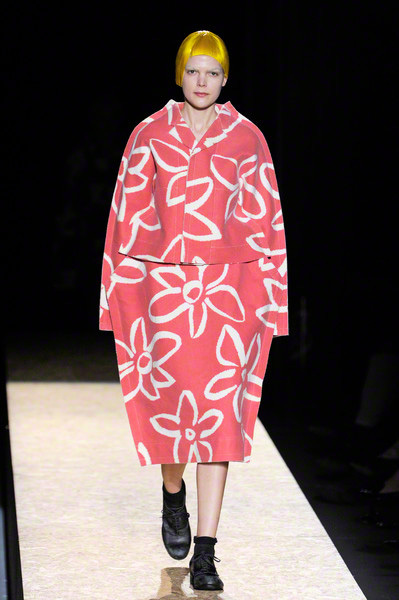 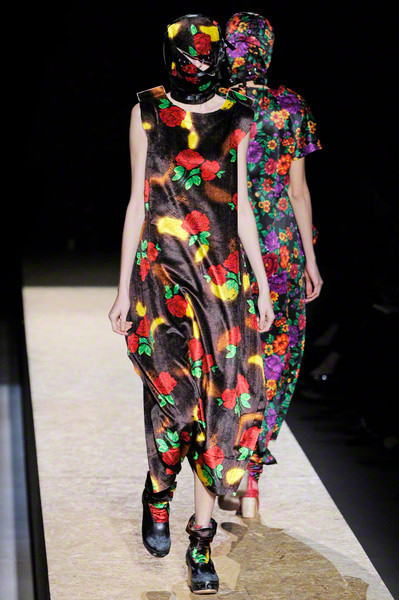 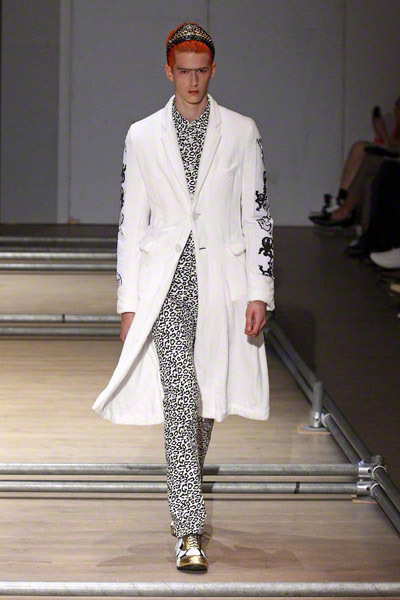 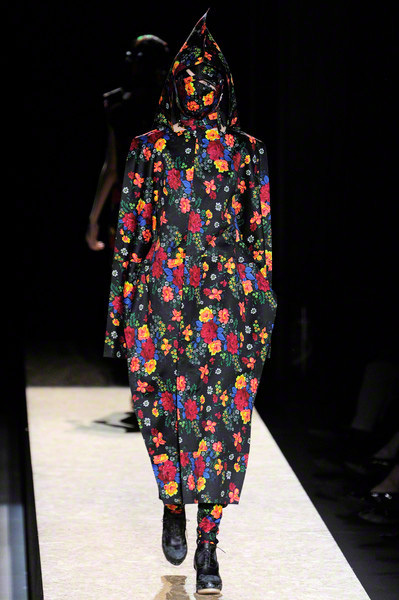 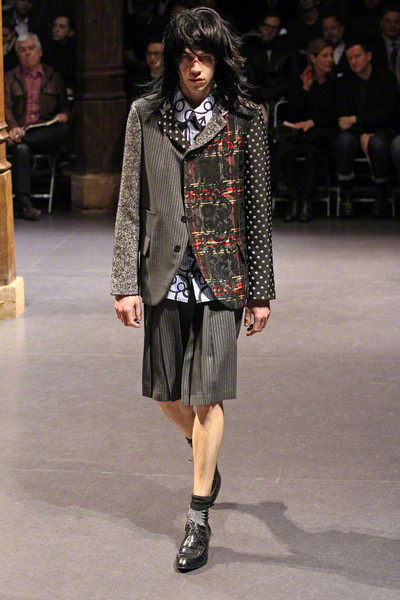 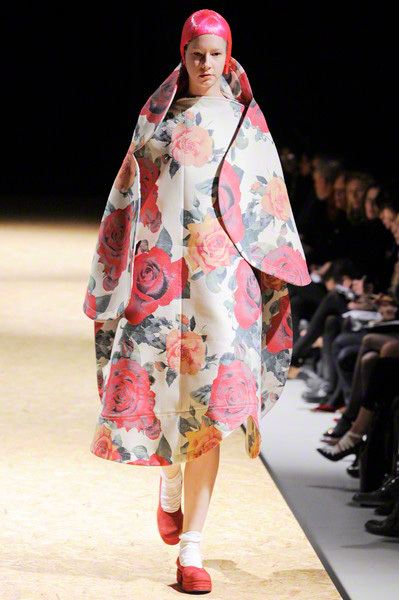 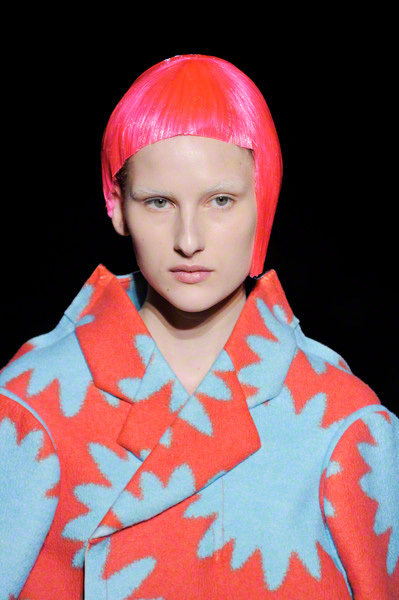 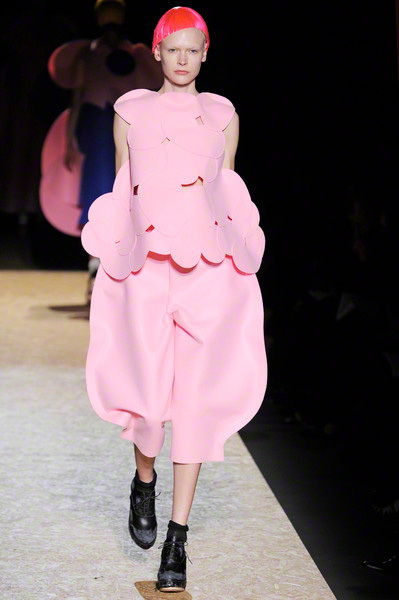 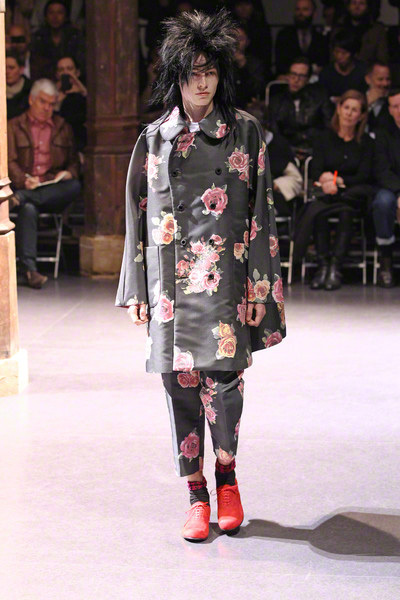 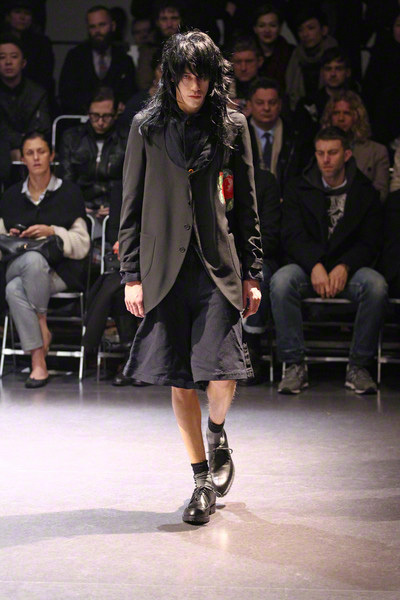 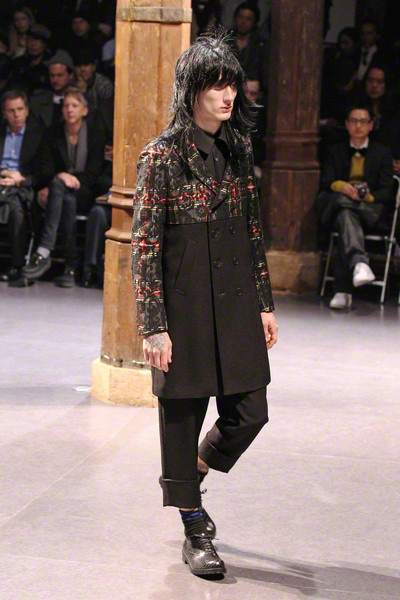 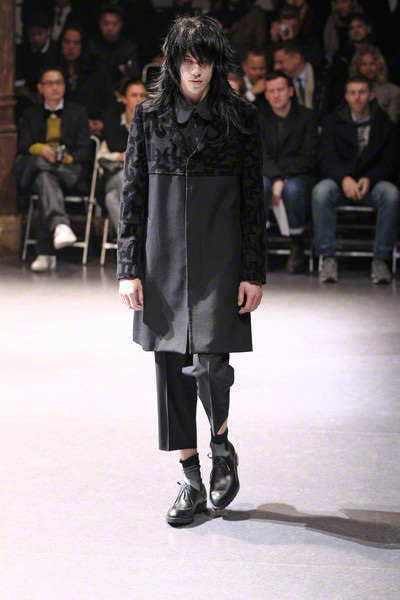 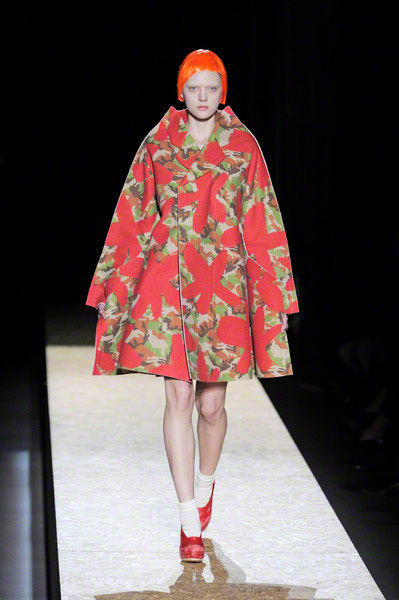 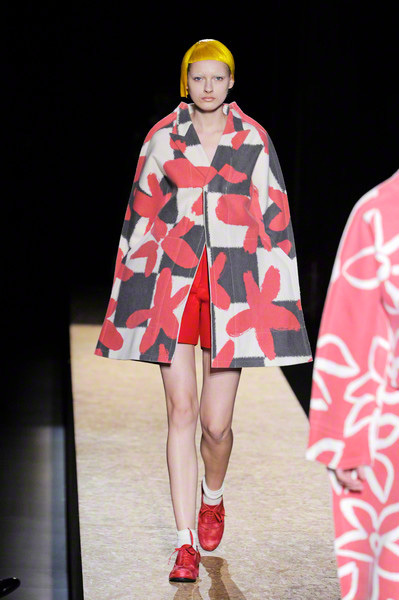 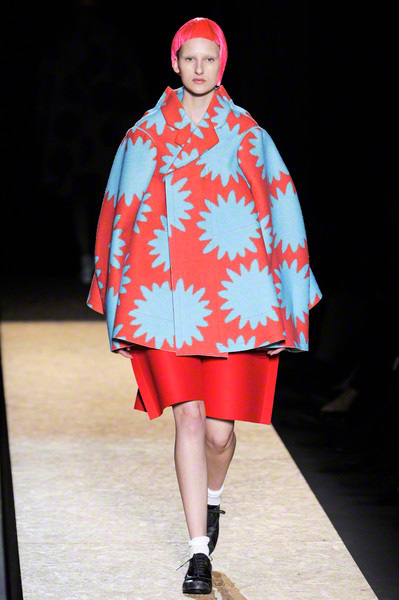 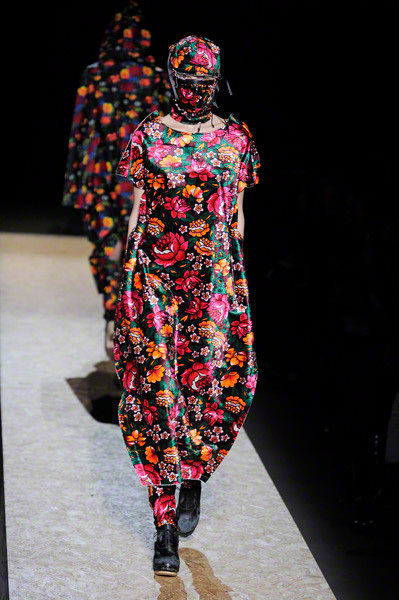 Though spring hasn’t yet sprung Comme des Garcons was fully in bloom on Saturday. 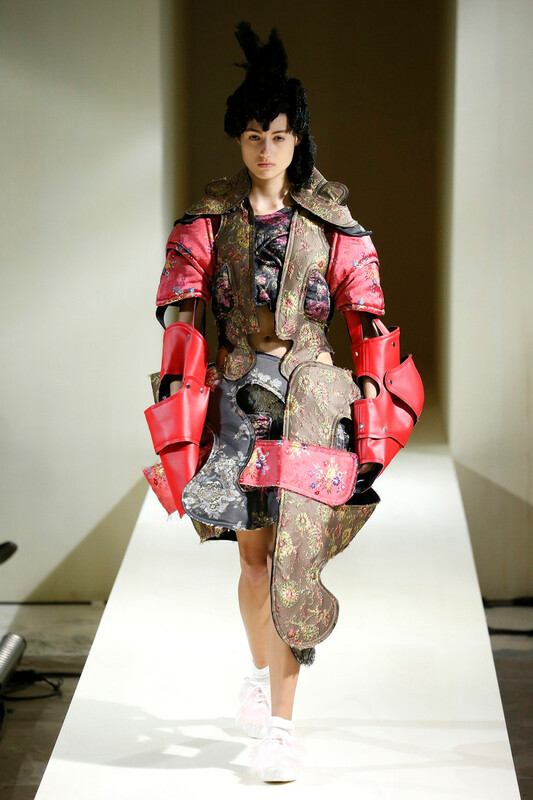 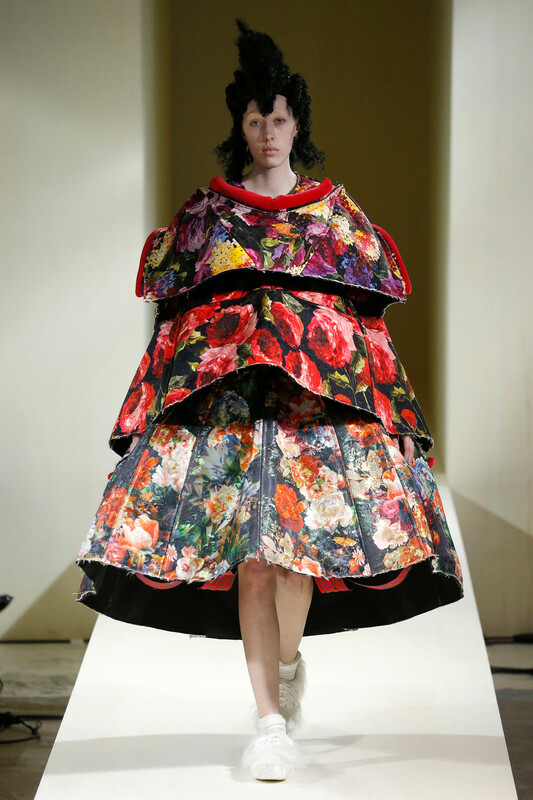 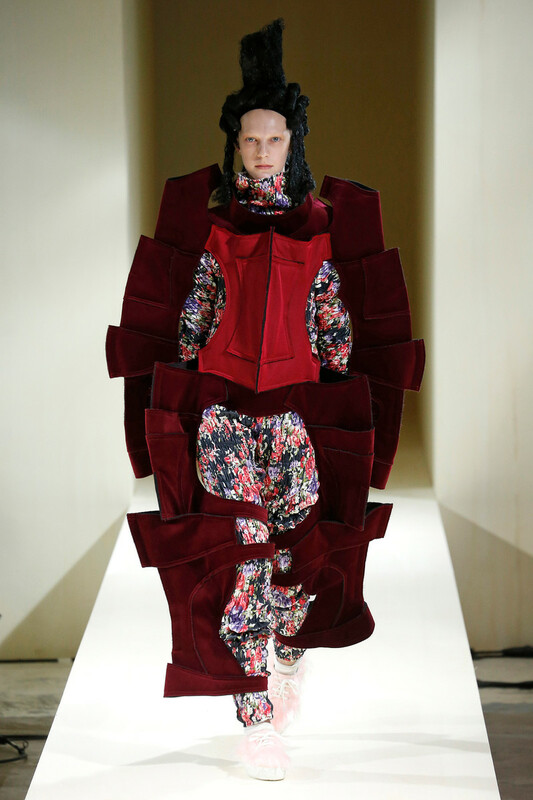 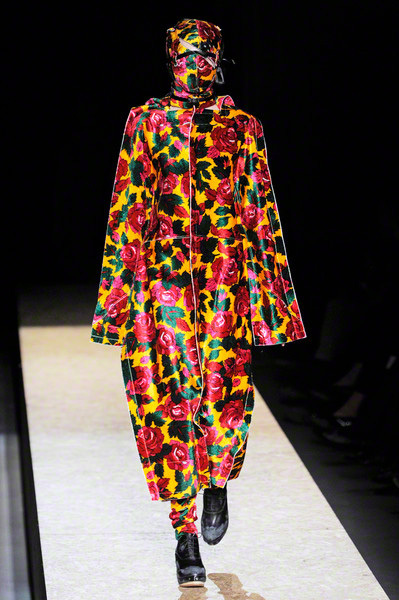 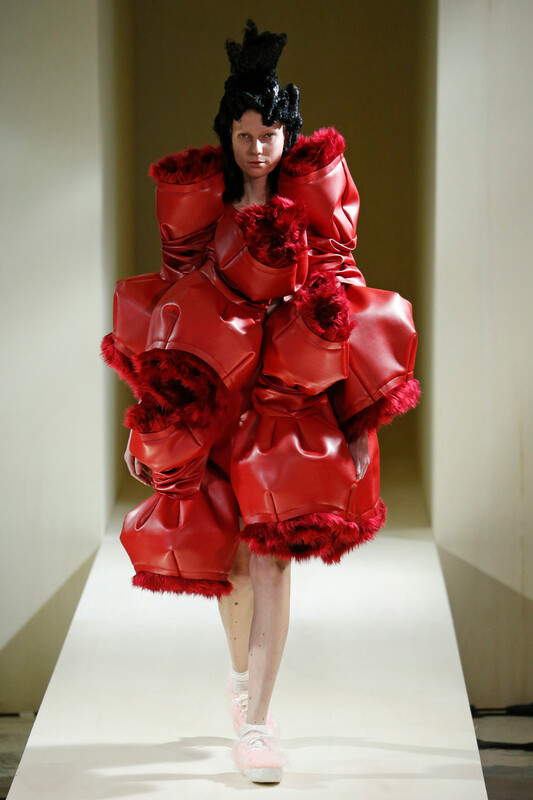 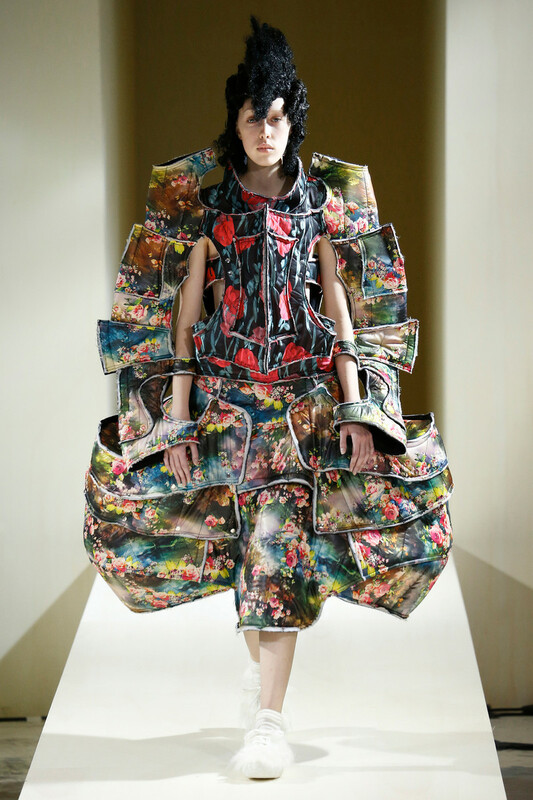 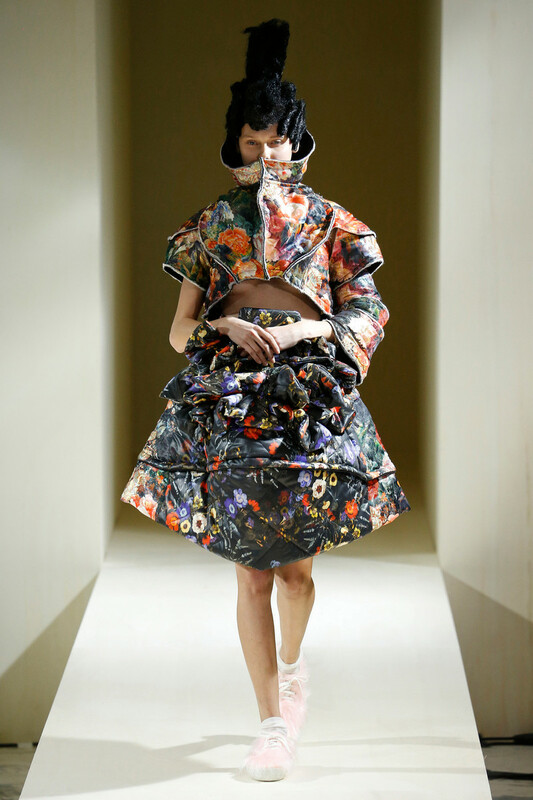 While imagining the punks in the 18th century Rei Kawakubo came up with a crafted collection of 17 outfits that embodied some serious floral explosion. 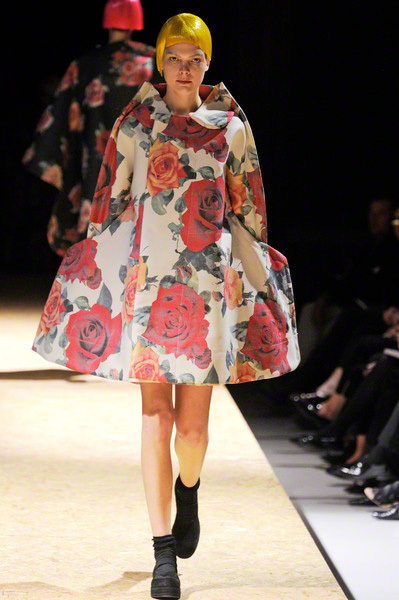 Rose petals, 3D flower constructions and a number of rose prints pushed the brands girly side forward. 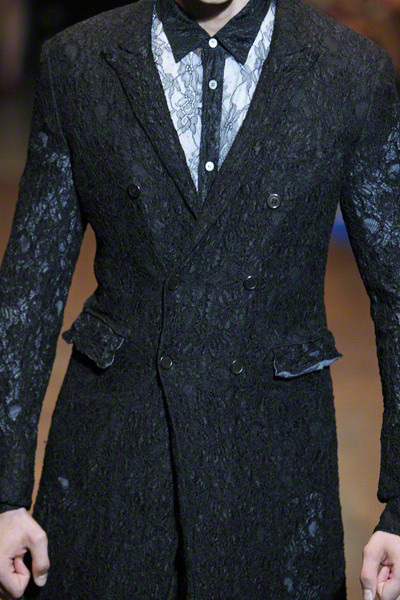 The richest materials combined added to the luxe layering concept of the collection. 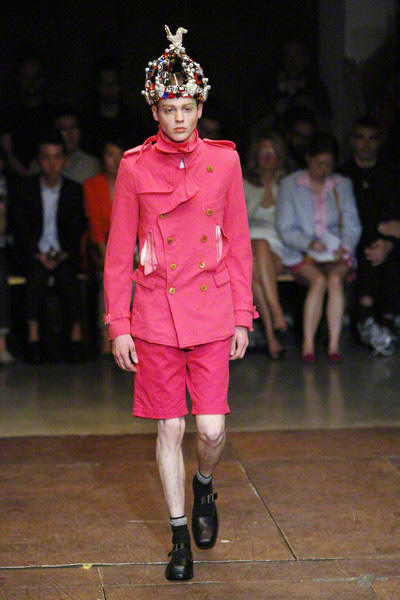 Pinks and reds all over, yet it wasn’t necessary a sweet and upbeat show. 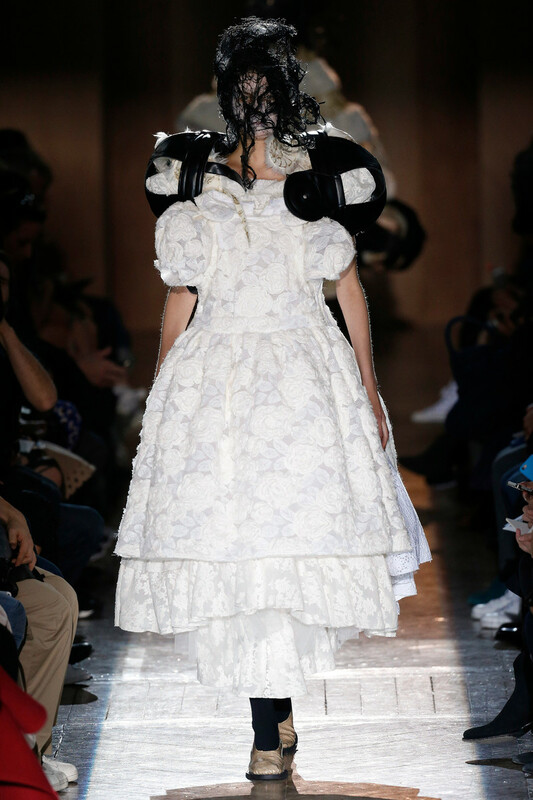 Rather, those architectonic creations accompanied by those 18th century black wigs seemed to deliver a darker message. 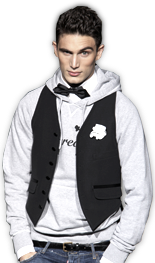 Stating there’s a revolution at hand. 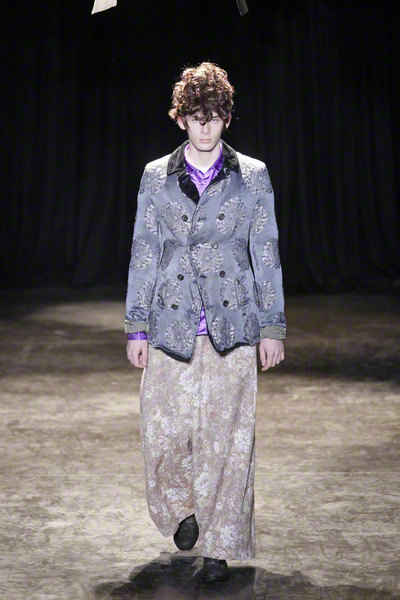 A fashion revolution wrapped in some glorious multiple rose-patterned jacquards, that is. 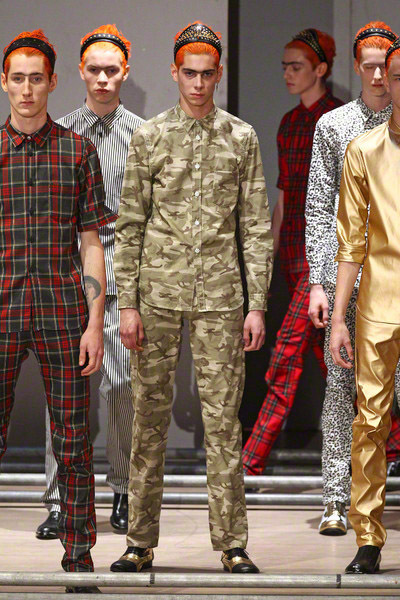 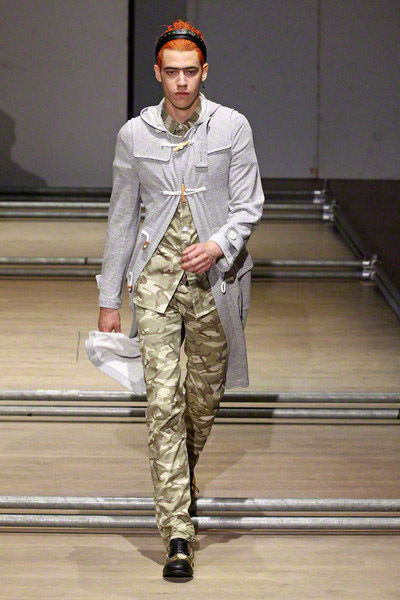 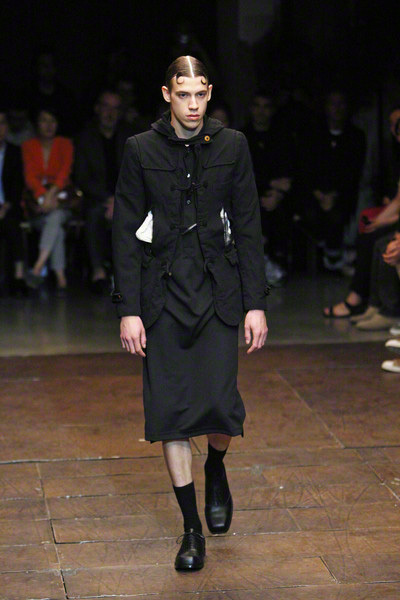 Rei Kawakubo sent an army of dressed-down guys onto her spring runway. 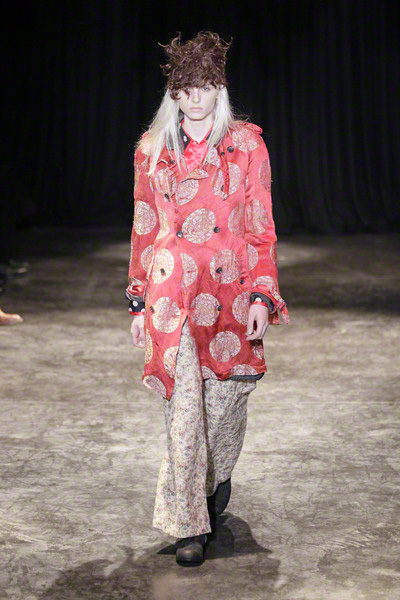 Their hair dyed orange and clamped with studded leather headbands, the models navigated a grid of steel poles wearing pajama suits paired with slouchy overcoats. 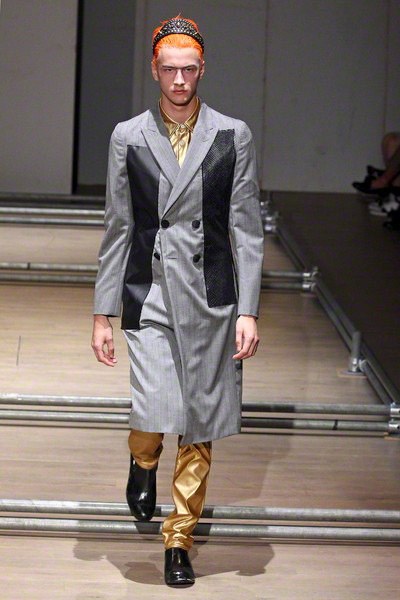 The designer underlined the collection’s rebellious mood by splicing together unexpected fabrics and silhouettes, such as a gray pinstripe coat with strips of black snakeskin and studded leather. 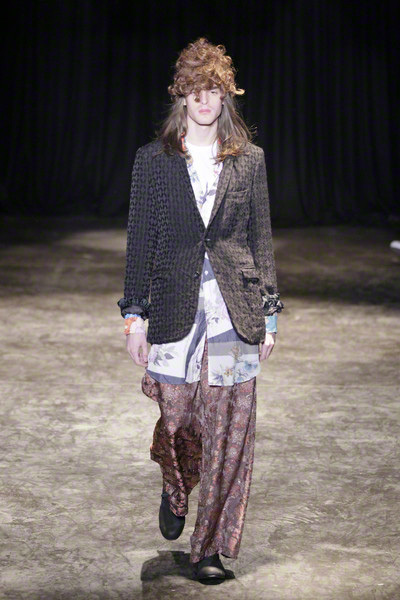 Her simple shirt-and-pant combos came in fabrics that could come from a rocker’s wardrobe — red tartan, leopard print, camouflage and gold lame. 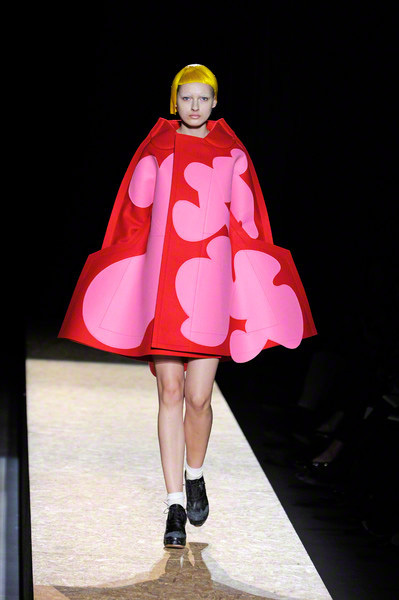 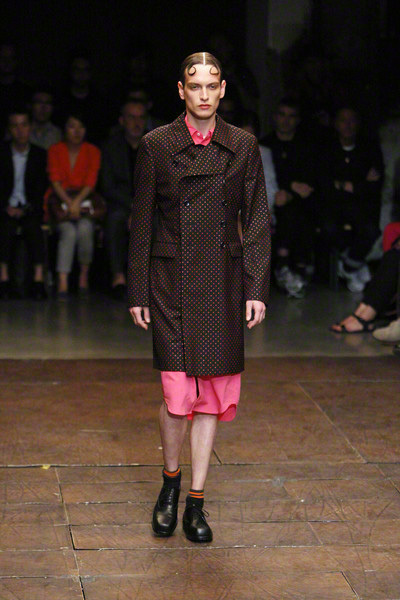 It was basically a two-dimensional collection that Comme des Garcons sent out yesterday.A play with volume, color and pattern. 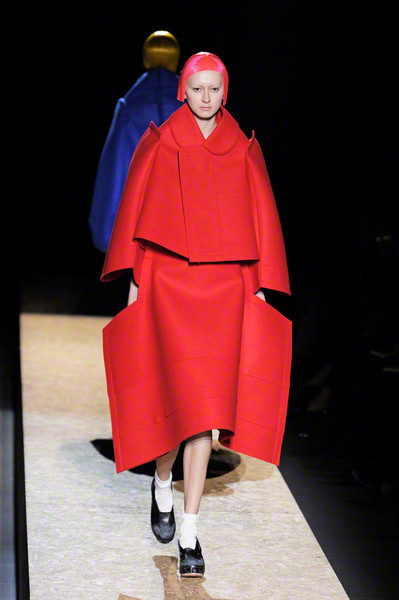 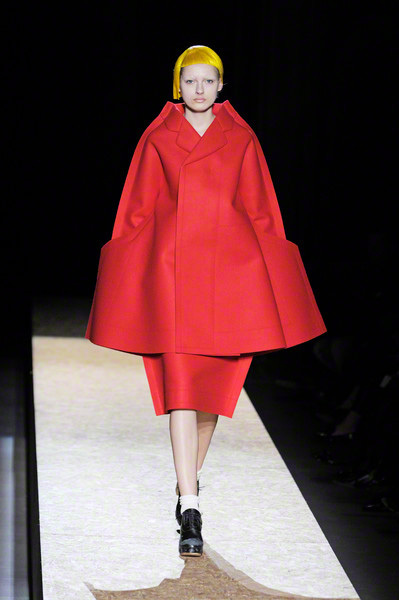 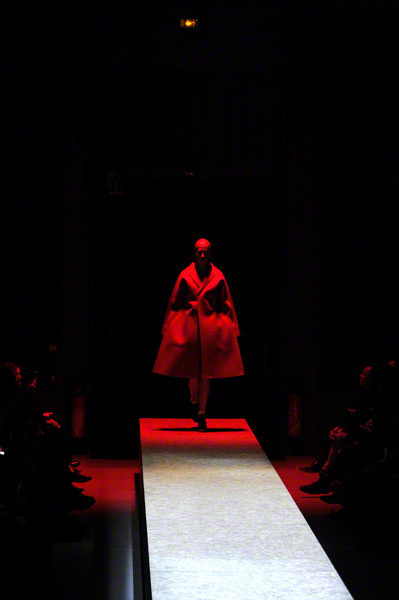 The first model that stepped at the basic, unfinished plywood catwalk wore a bright red coat, big and bold when viewed full frontal and flattened in profile. 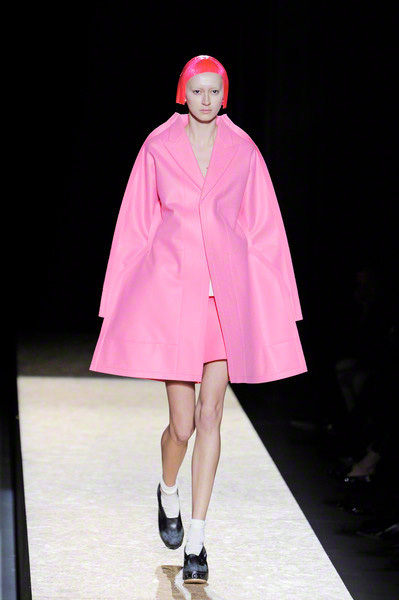 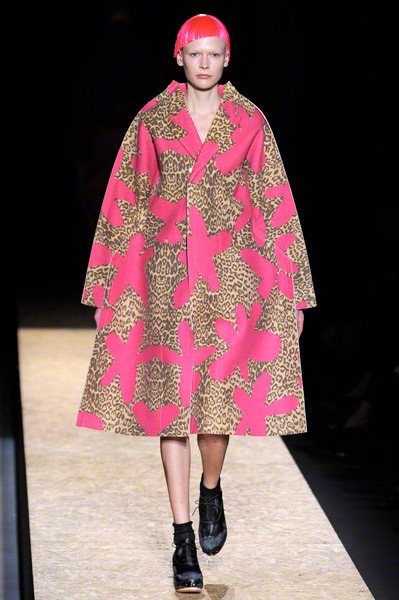 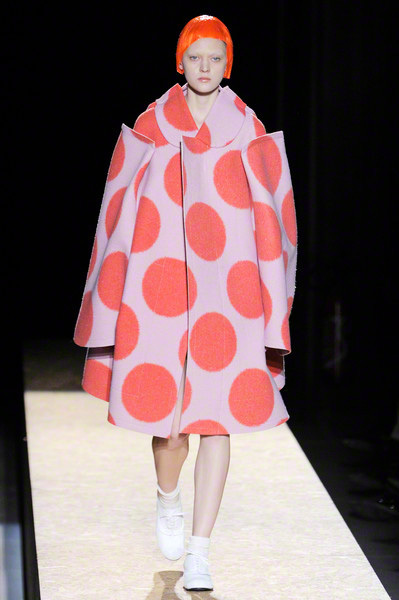 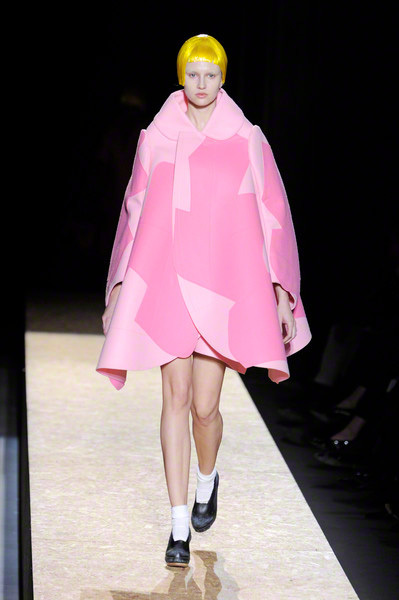 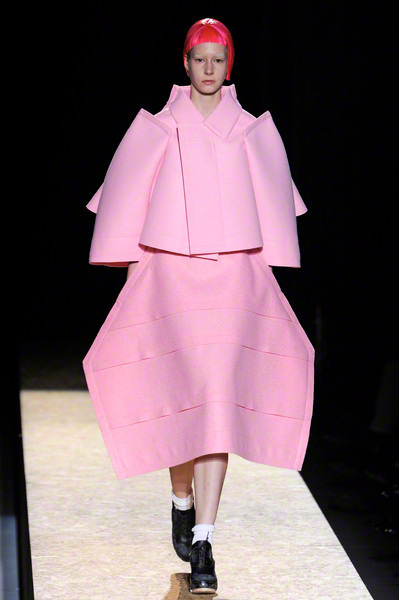 Next came another coat, in pink, later a pink-and-blue circle frock. 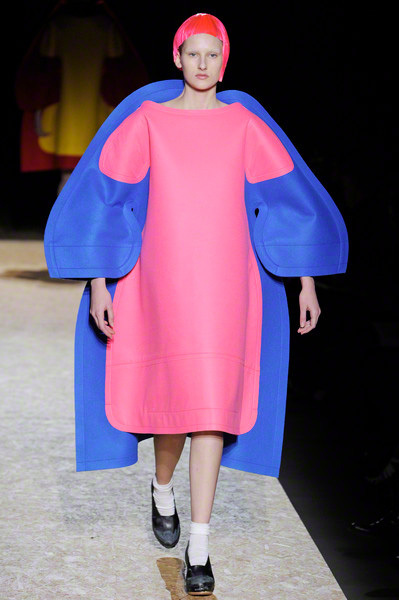 The show was an explosion of outsized graphic precision and vibrant color. 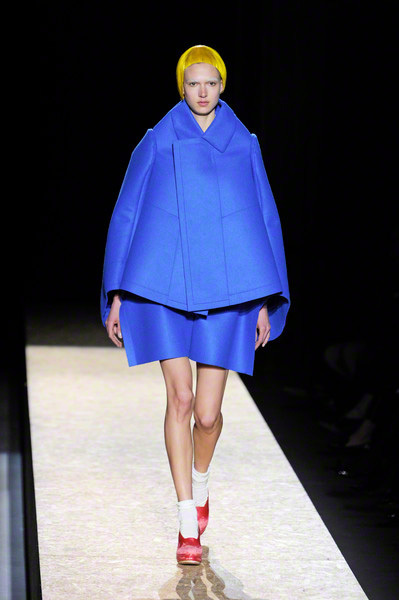 With their their bright plastic helmet bobs atop clothes cut big and flat, the models looked like paper dolls. 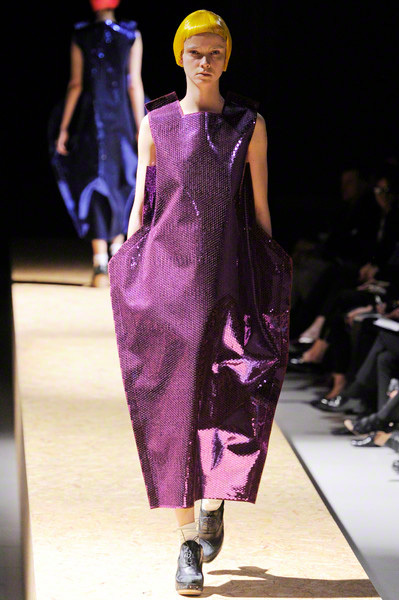 Fabrics were structured and in clear, dense hues. 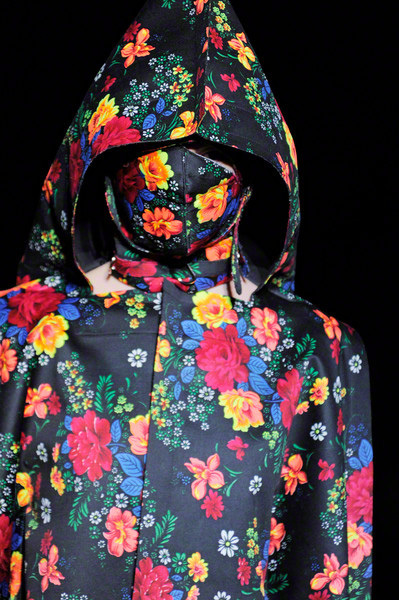 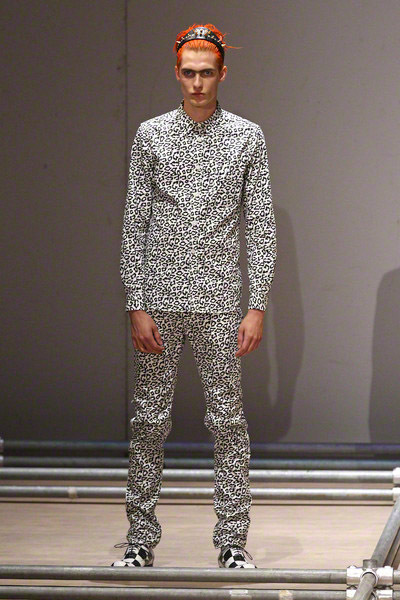 Patterns – dots and flowers – were mega-big. 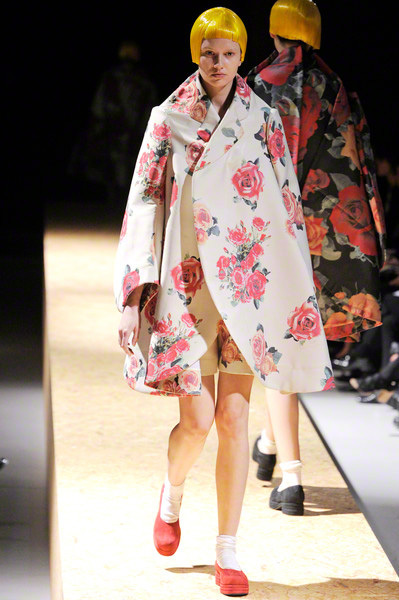 After the flat textures came shine and a small group of girls covered in rose prints with their faces hidden in the fabric. 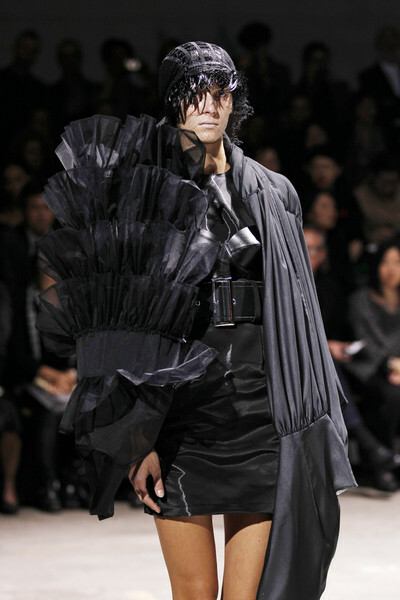 A bunch of sexless punkers with a touch of Goth; that’s how you’d describe the models walking todays Comme des Garçons show. 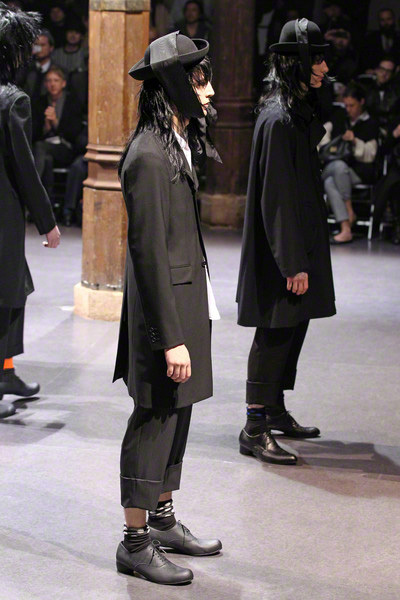 The male models walking the show often appeared like girls, due to their crazy black wigs, but also because of the very feminine designs they got put on. 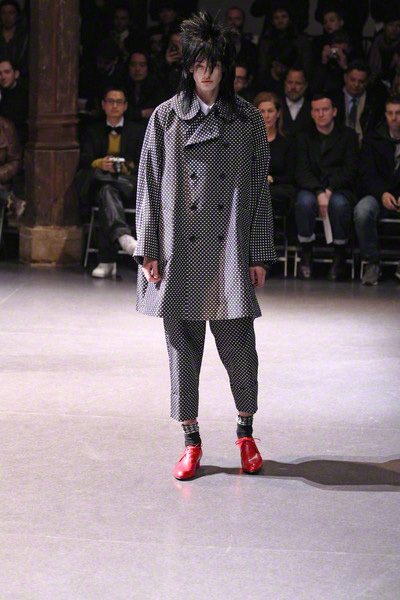 They wore tailored polka dot coats, pleated skirts and long tunics. 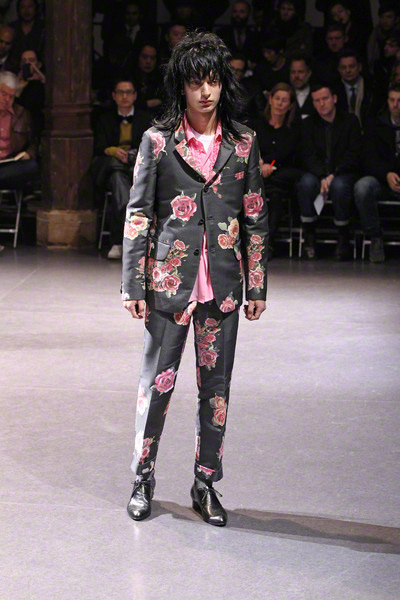 Not to mention the rose print that popped up on some dark colored jackets and pants. 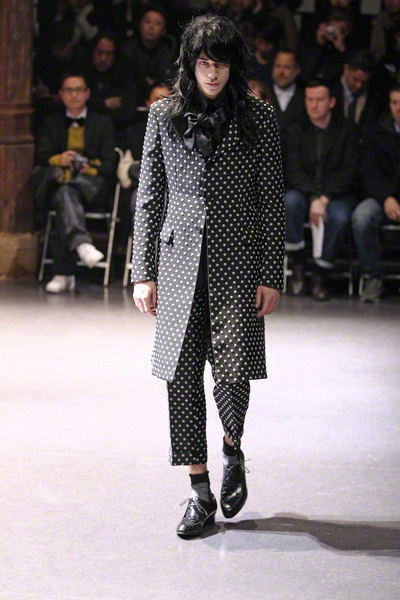 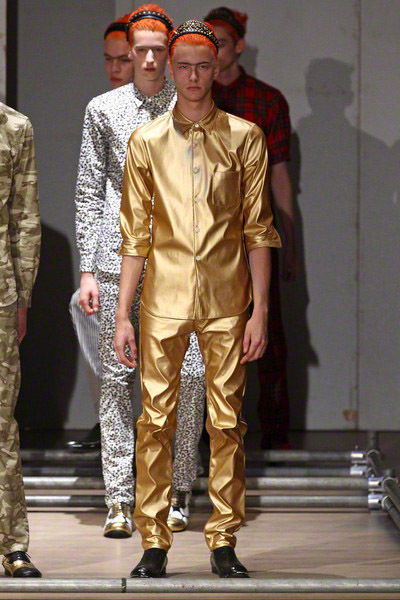 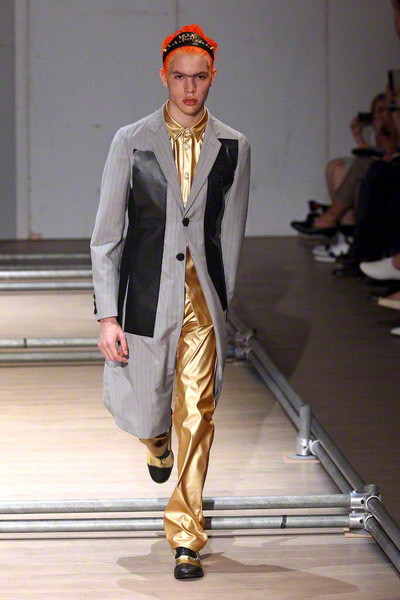 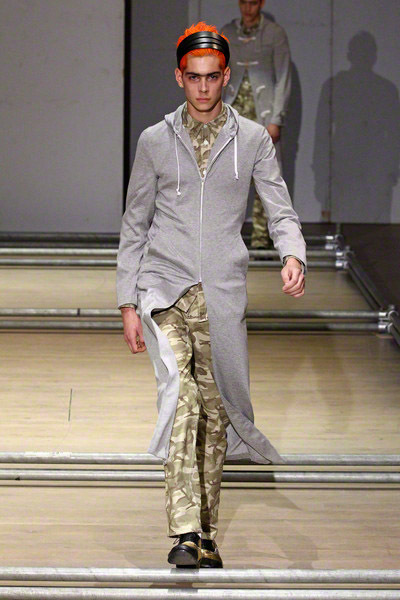 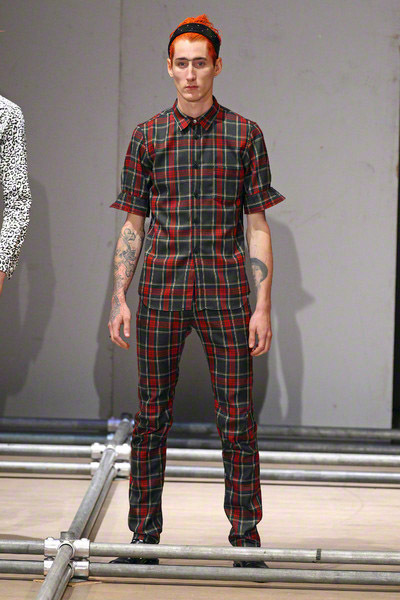 Though the designs were perfectly tailored the image the show portrayed was kind of confusing. 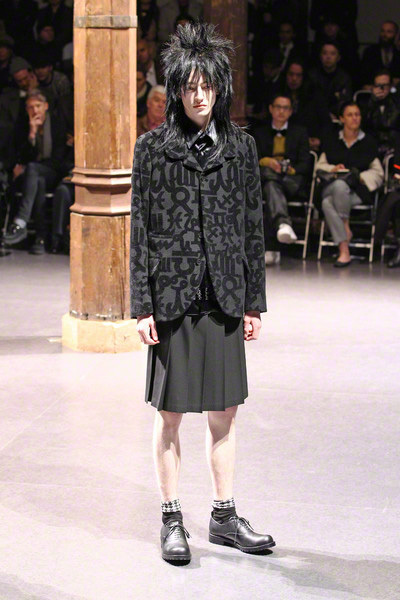 Then again, we shouldn’t be to shocked about lack of gender in this collection. 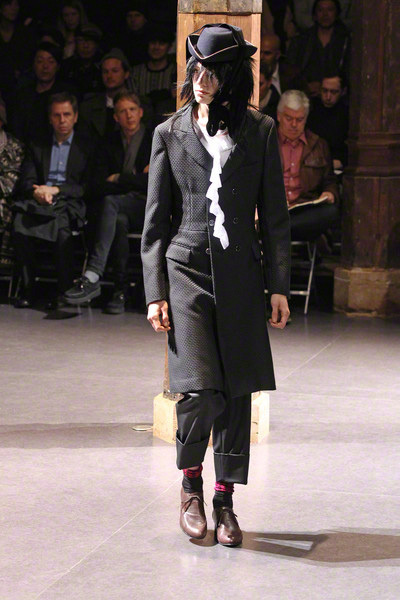 Androgyny is a big trend in the international fashion scene right now and Rei Kawakubo was right to jump right into it. 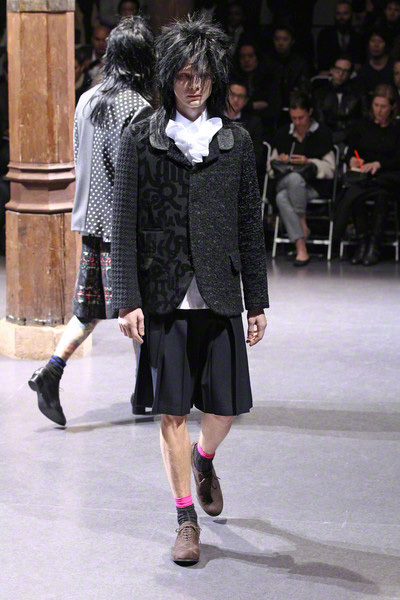 Comme des Garcons again played the game of female and male dressing, Lace, pink, shiny fabrics, polka dots, crystal studs, frills – you really have to be a daredevil to wear this clothes with an attitude. 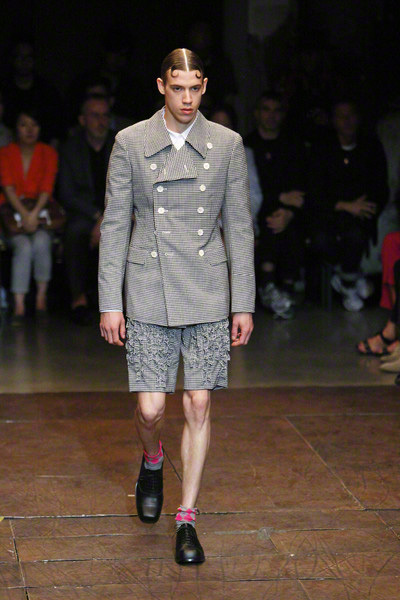 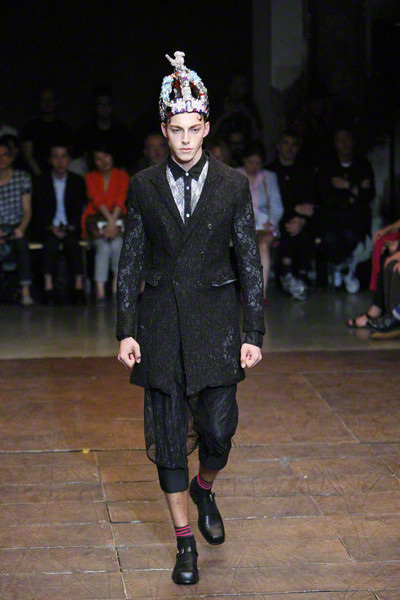 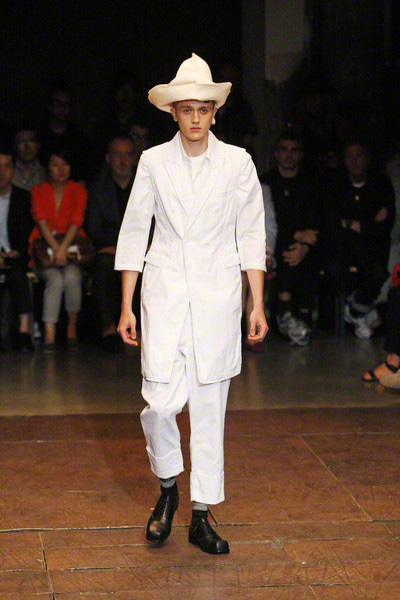 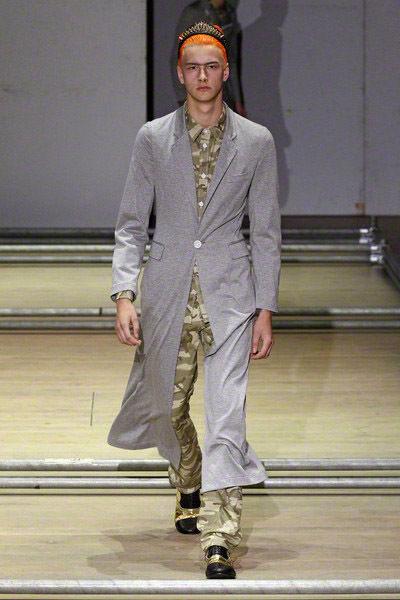 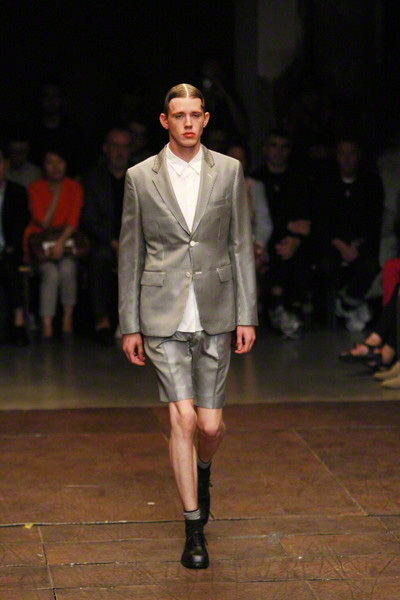 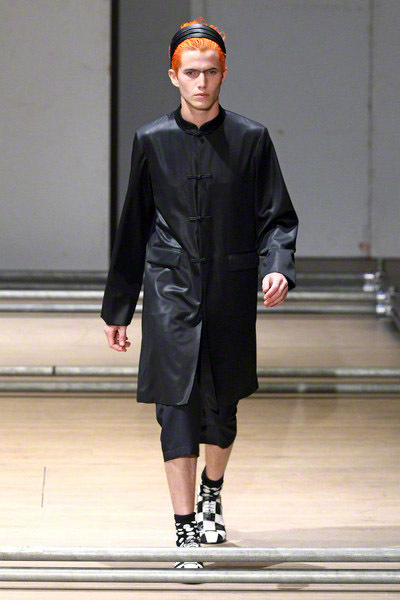 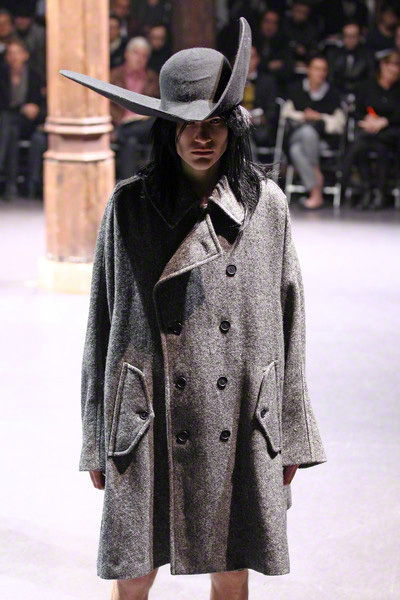 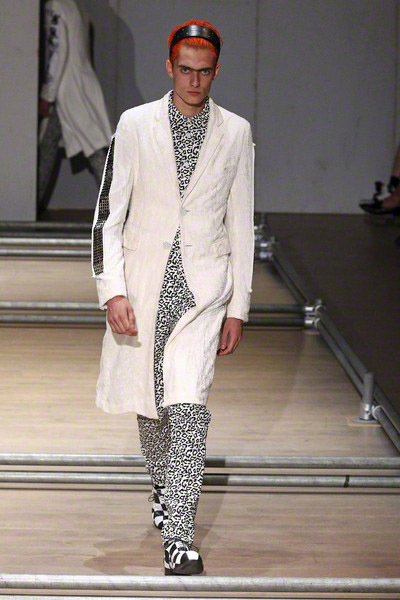 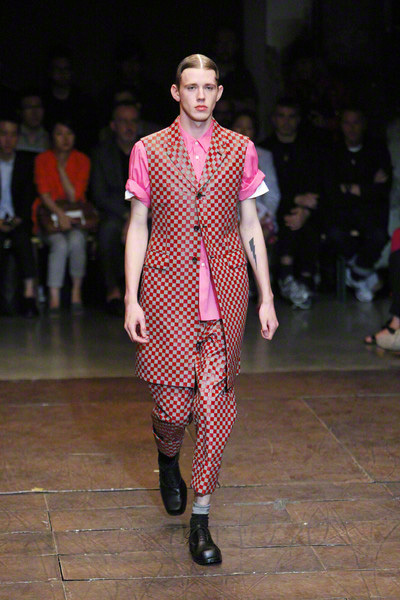 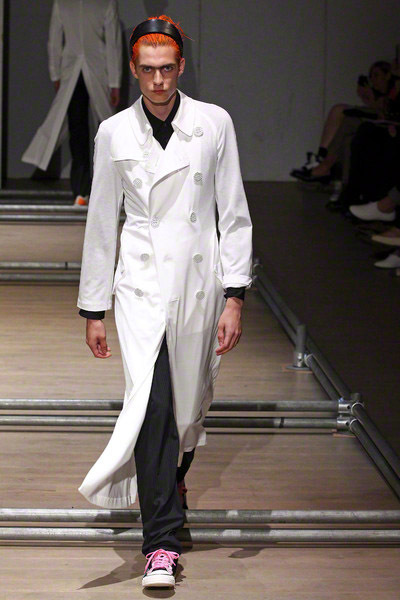 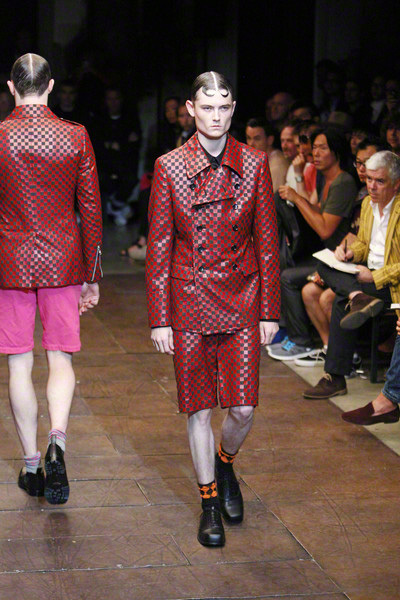 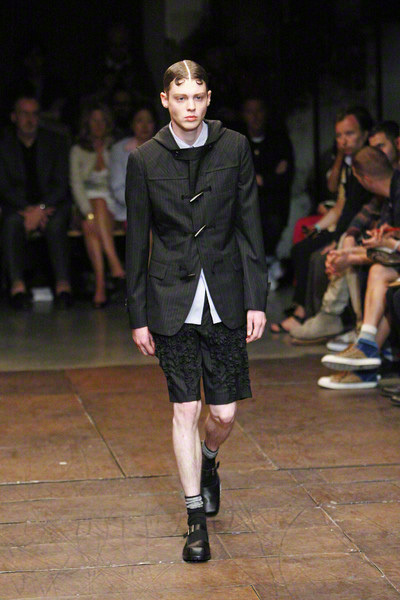 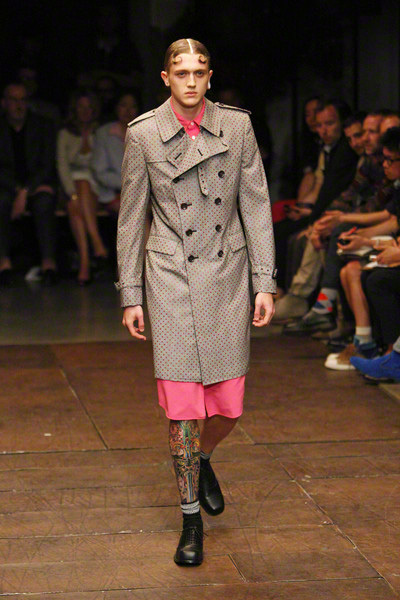 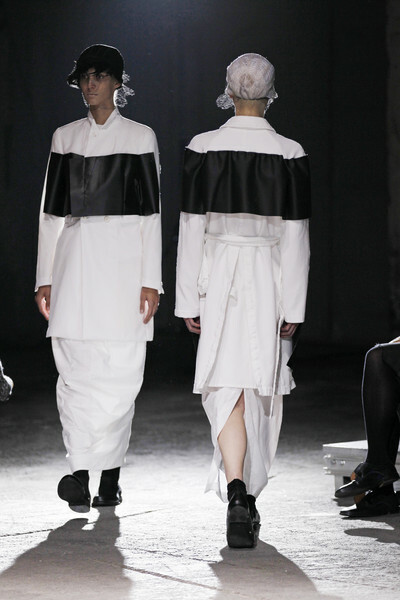 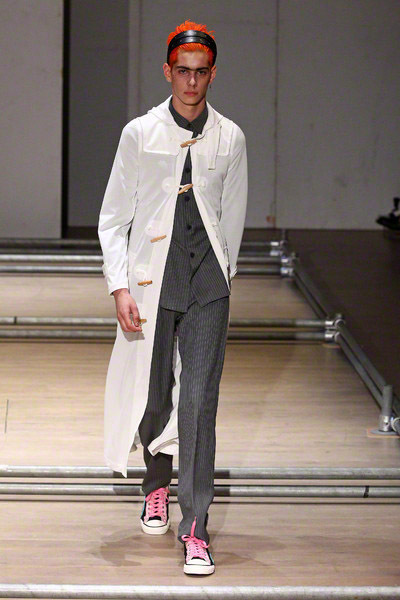 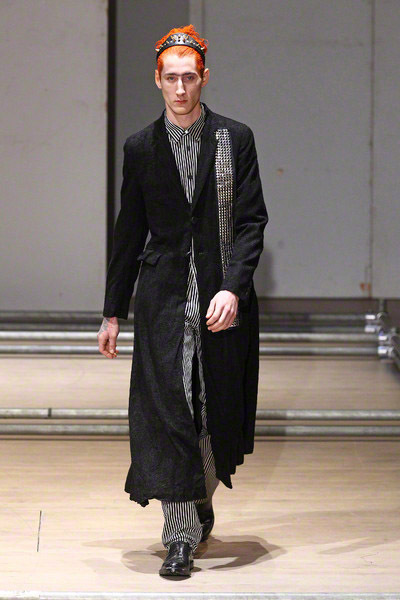 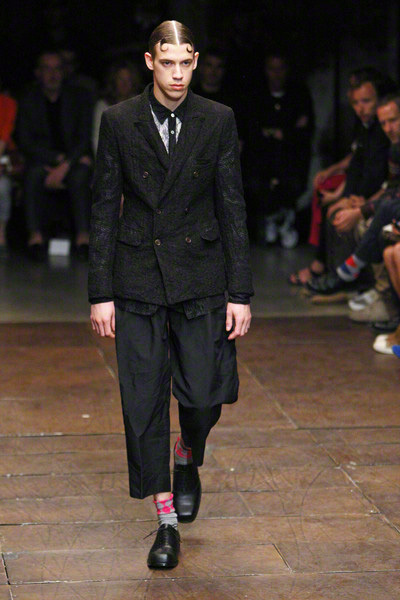 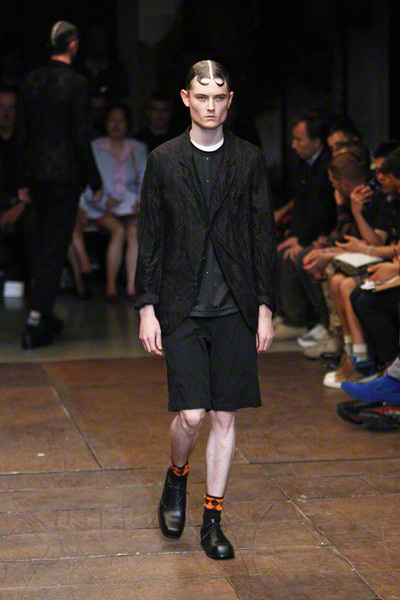 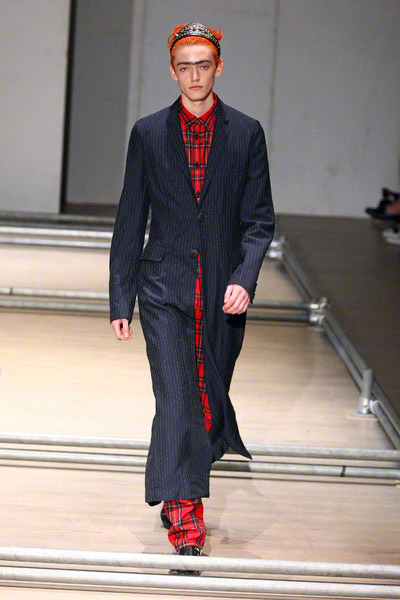 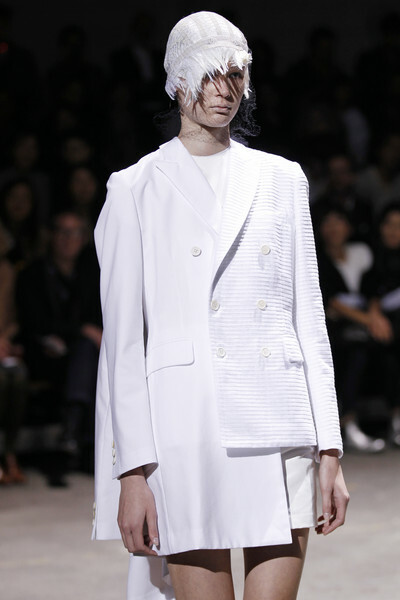 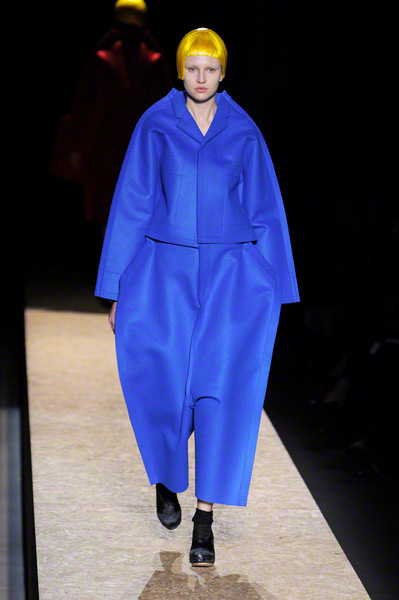 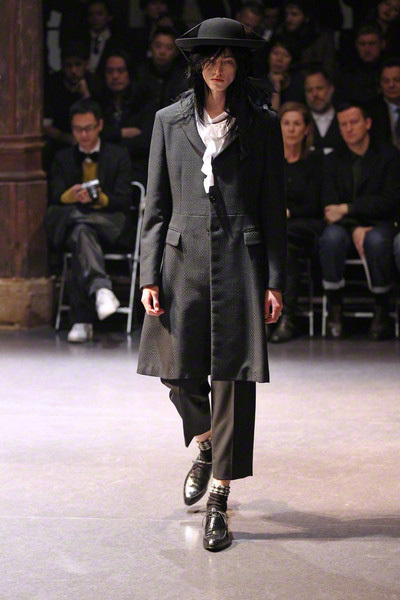 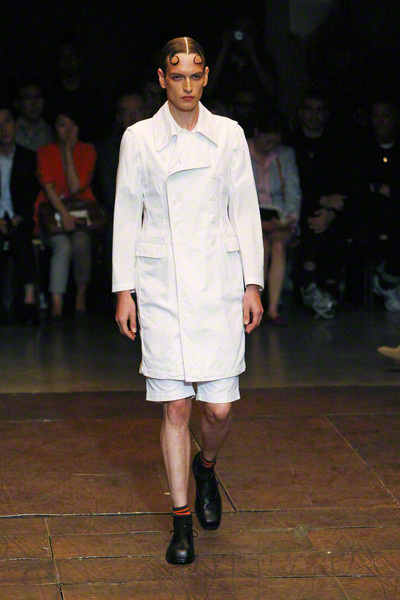 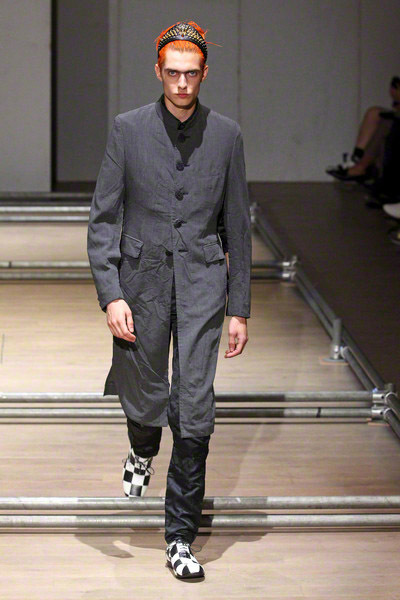 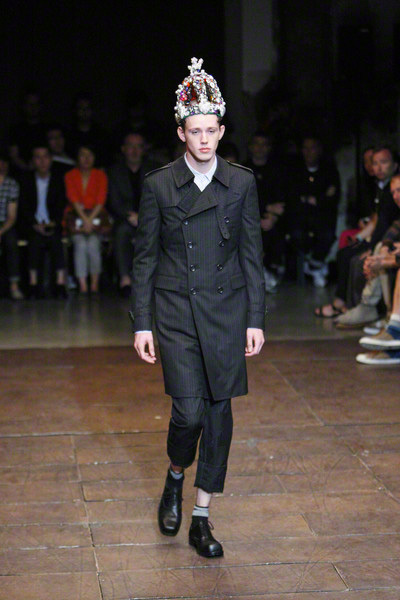 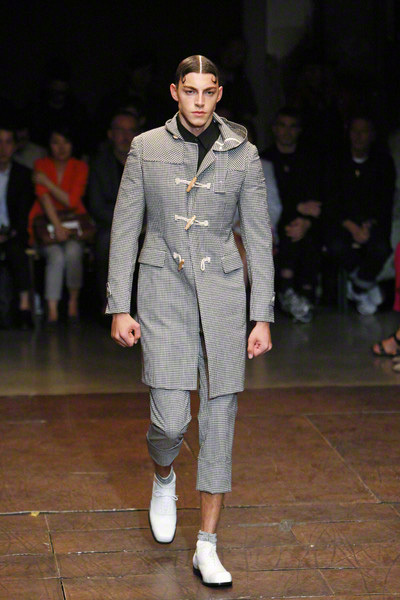 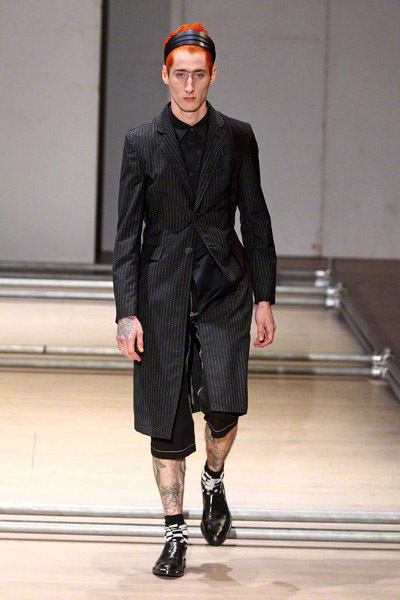 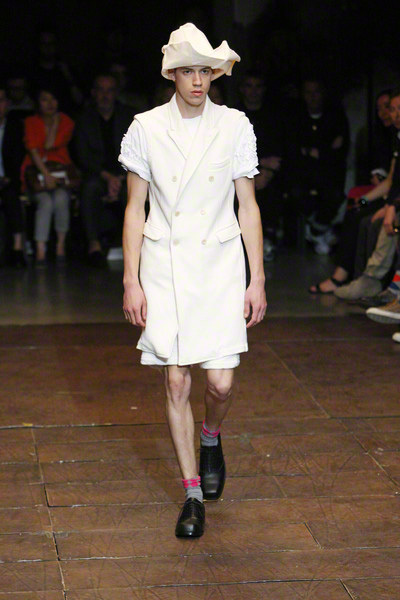 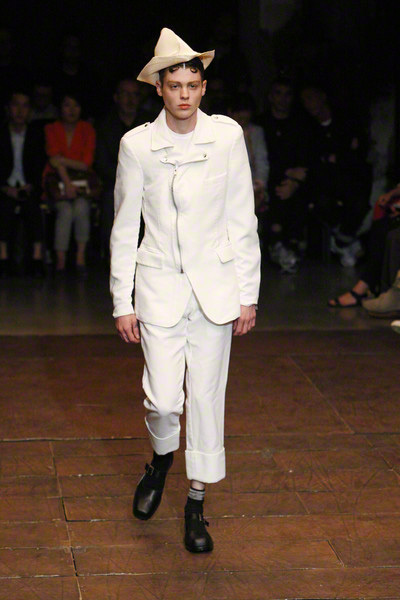 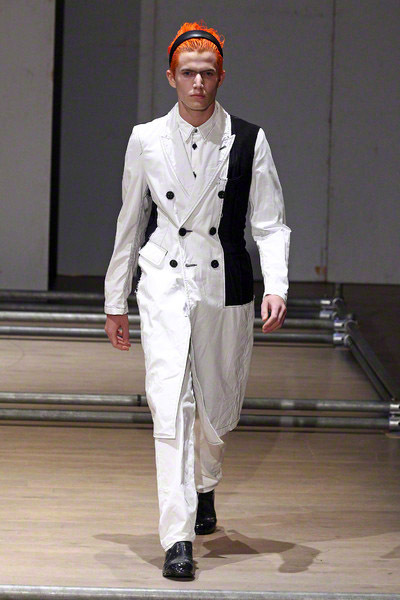 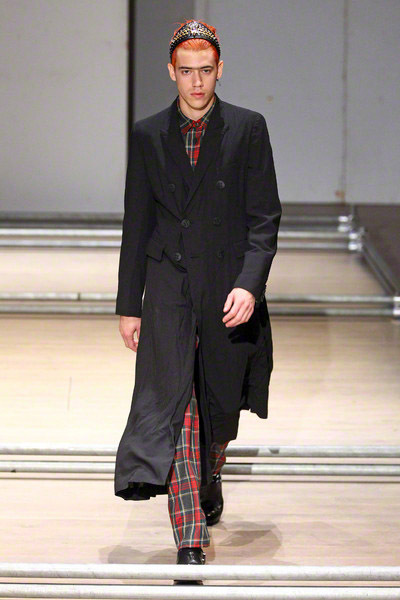 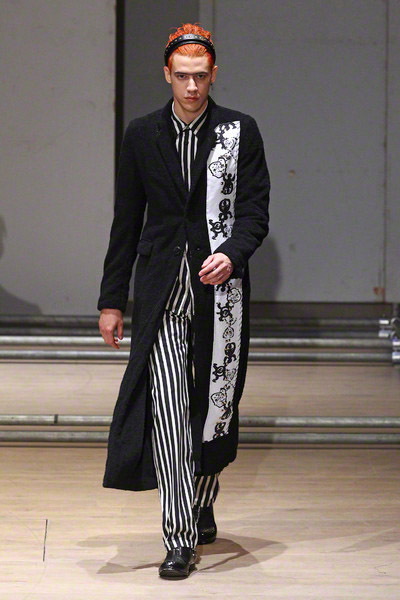 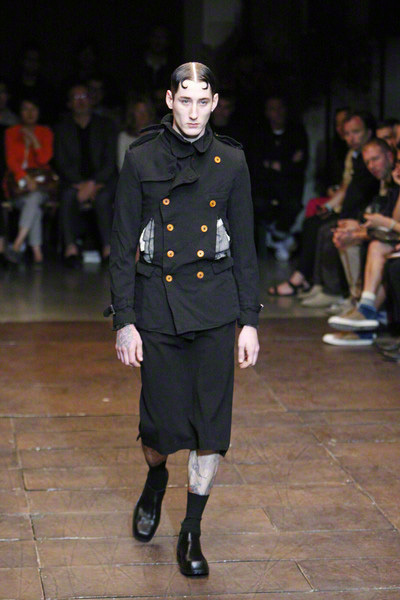 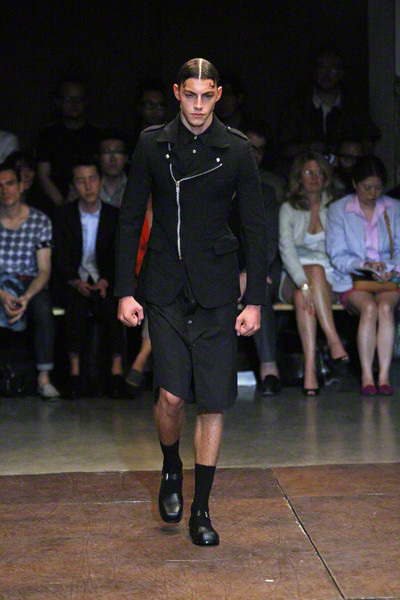 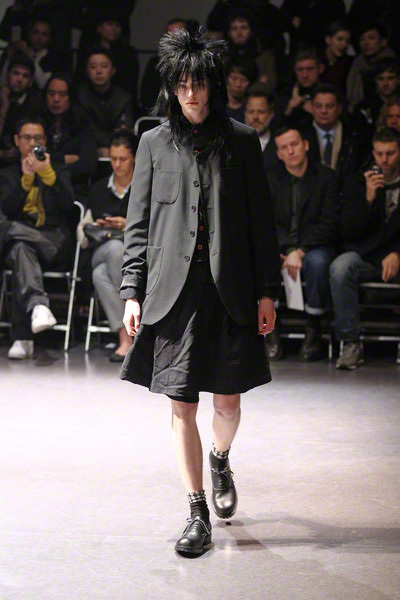 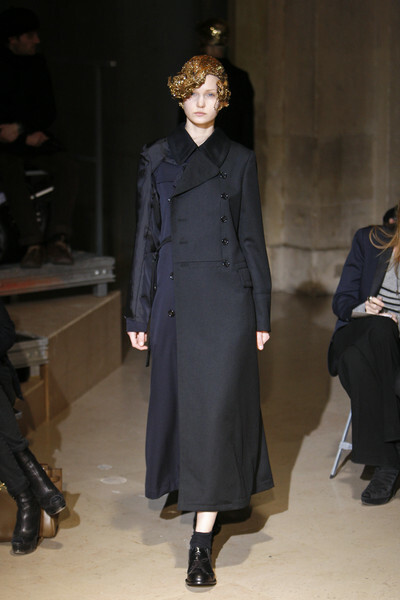 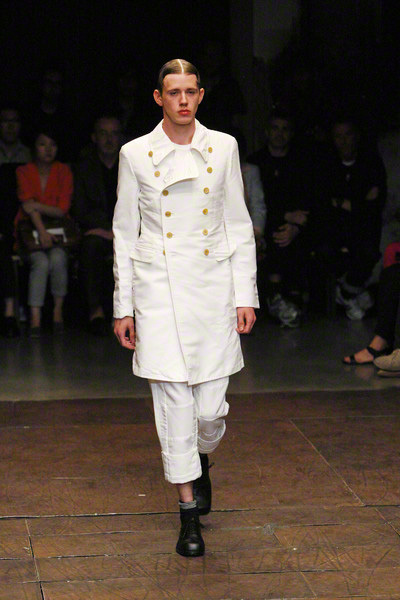 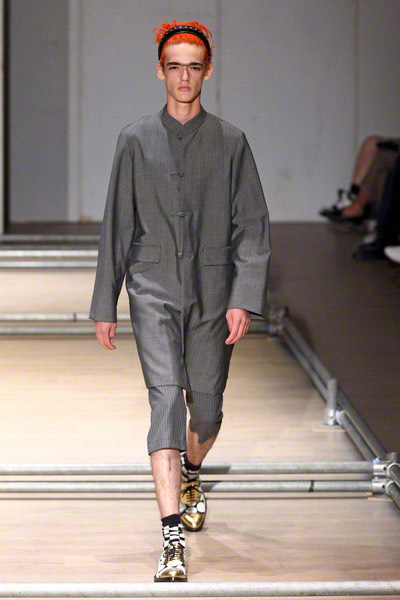 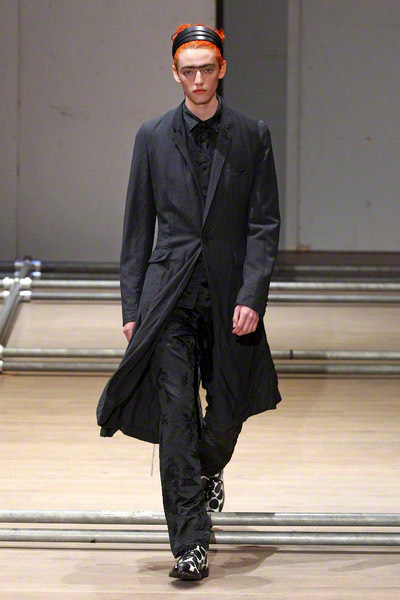 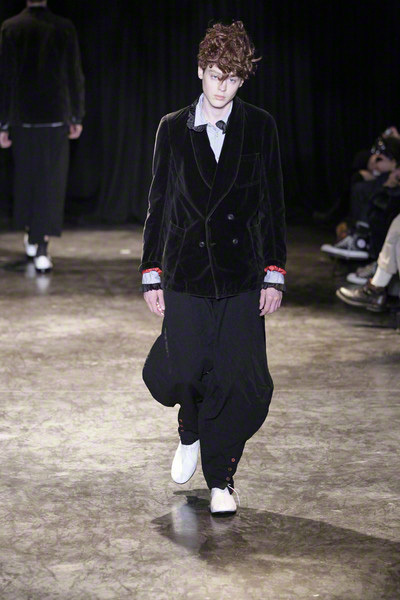 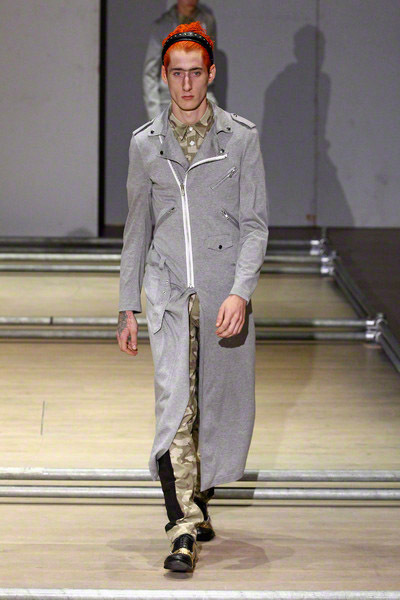 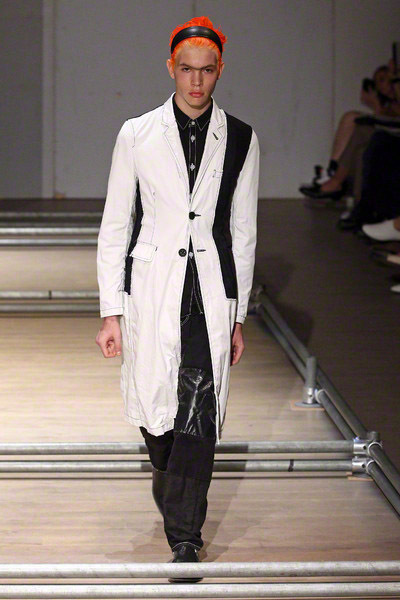 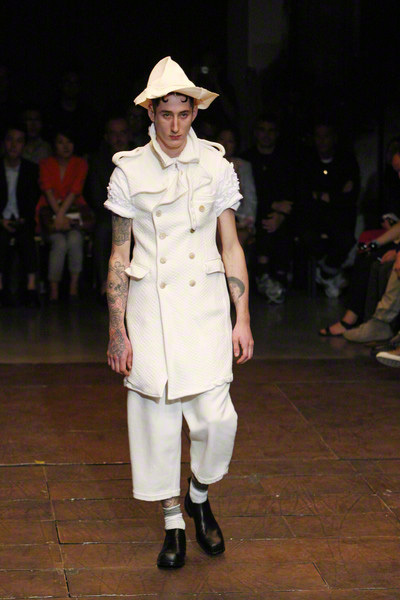 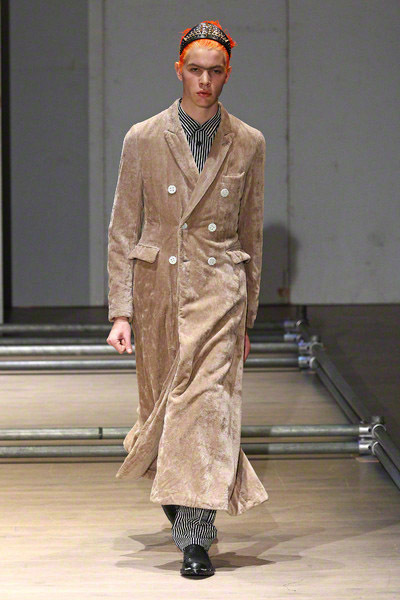 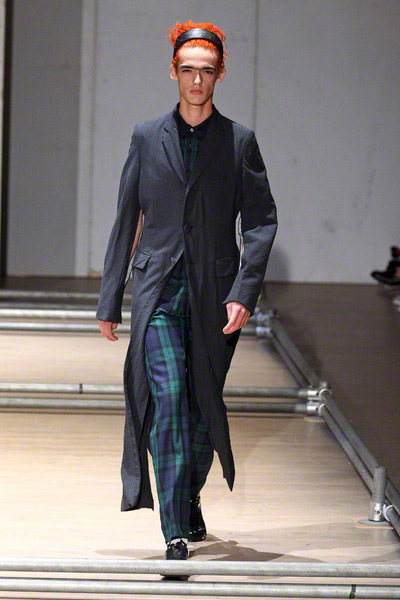 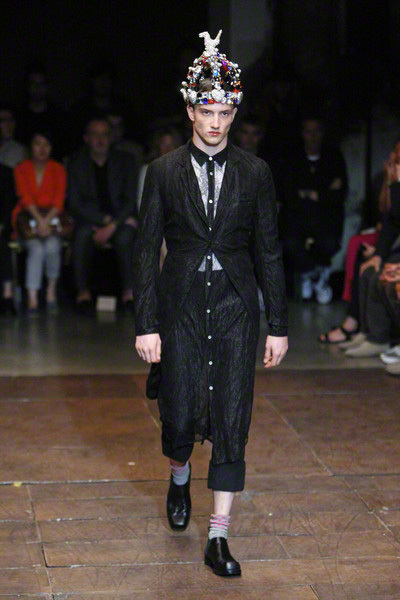 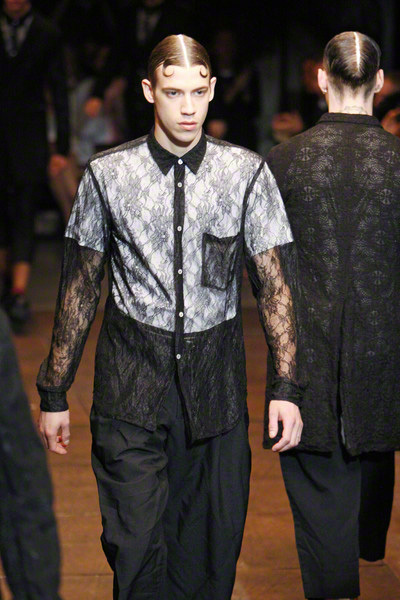 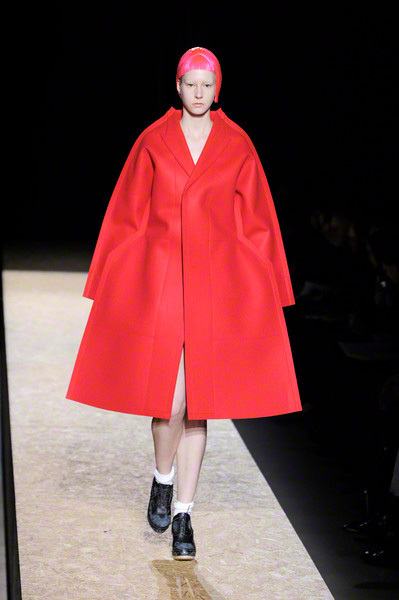 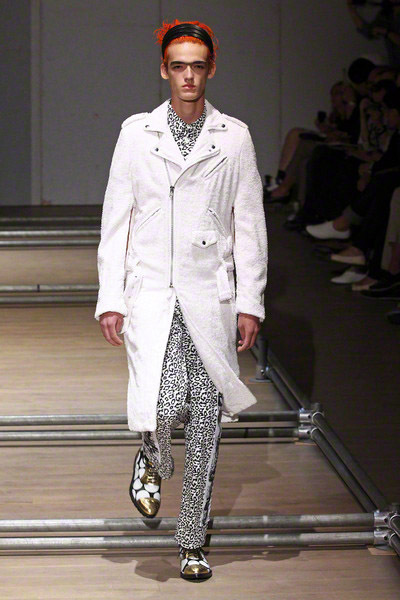 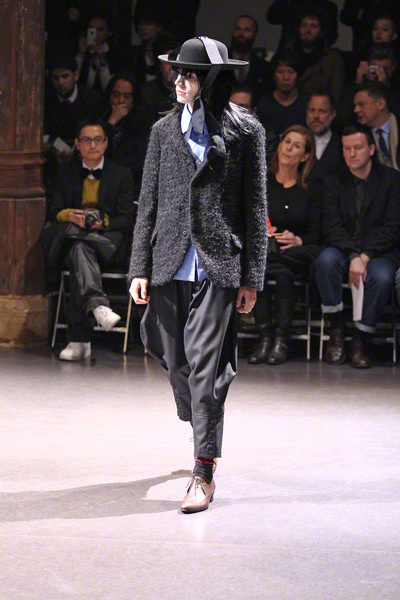 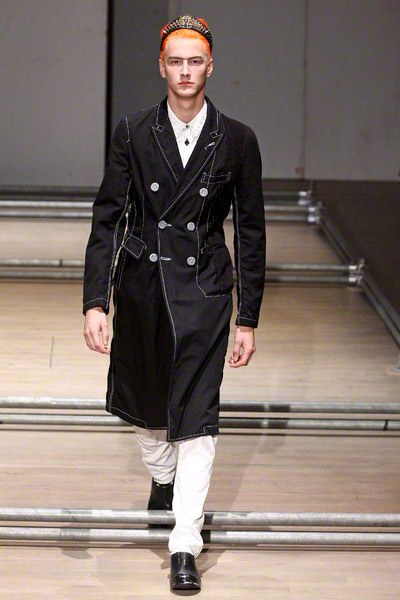 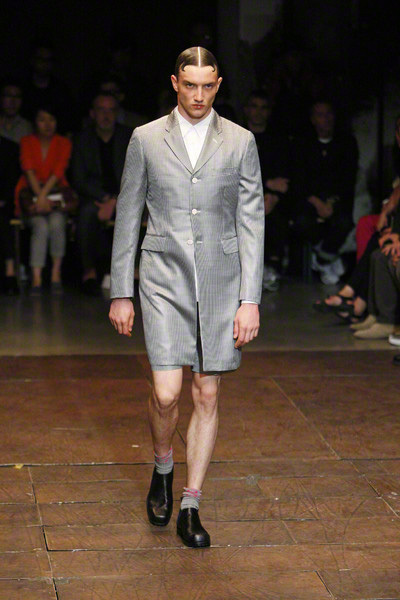 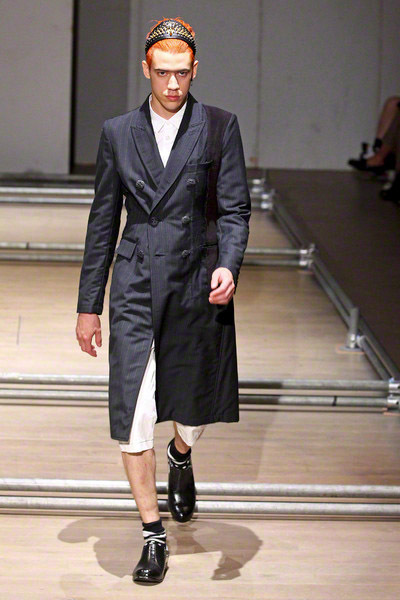 But it stays interesting how Rei Kawakubo keeps on pushing the boundaries of men’s clothing, the codes etcetera. 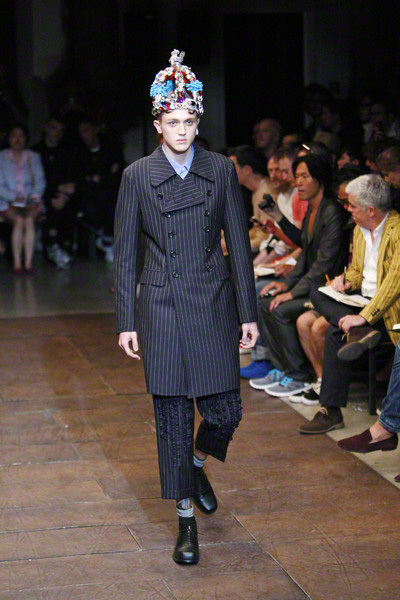 The plot seemed to be an English boy who dreams of being a dandy prince. 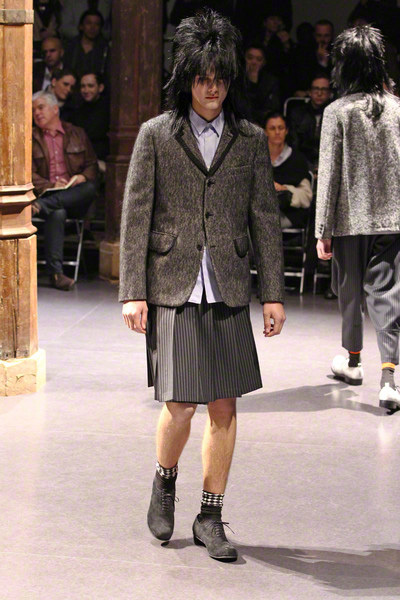 Well, that explains something. 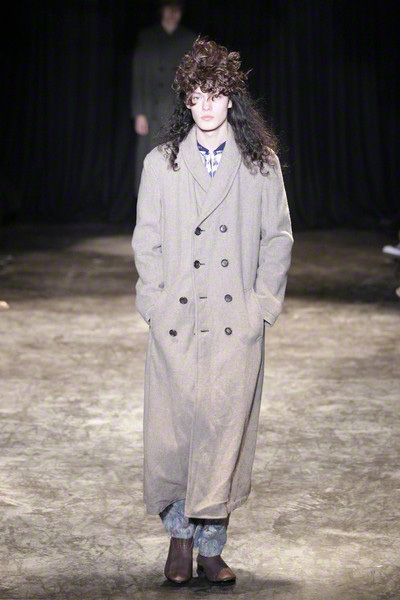 What’s left after you leave all the decoration out, are nice long coats, good trenches and simple pants. 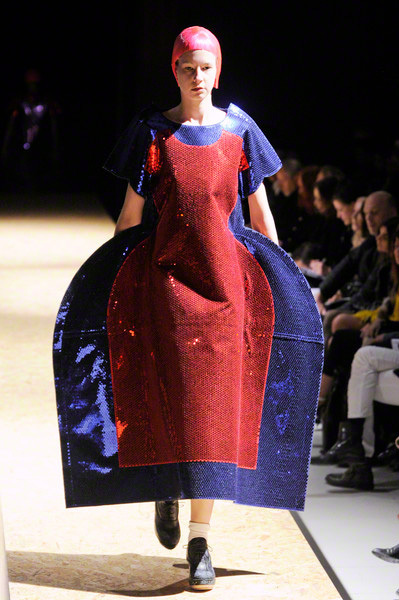 But it’s the eccentricity that makes it worth looking at…. 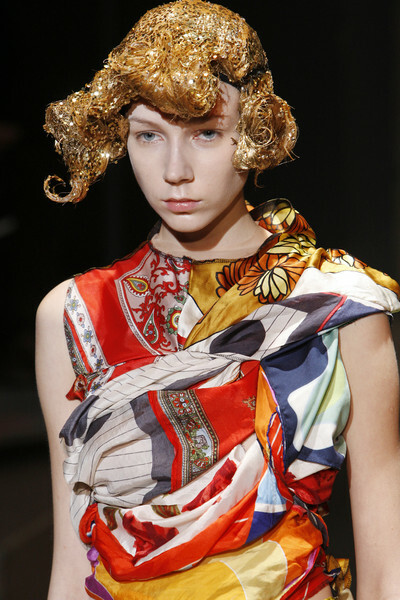 Looking at the location, the finale of the show and the hair of the models, Rei Kawakubo of Comme des Garcons chose gold as the new color. 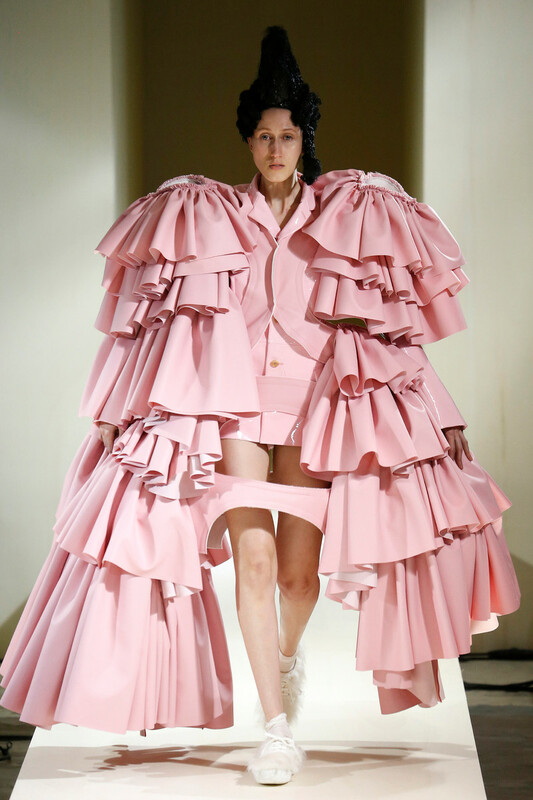 But that conclusion was made after the ‘Hybrid fashion’ she presented: from the front a coat looked like a python trench but from the back it were frilled shorts. 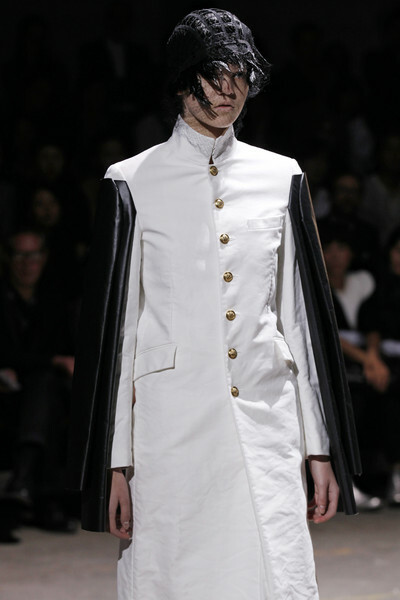 Or from one side an outfit looked like a schoolboy jacket and pants and from another perspective it was a silk blouse with a sheer front. 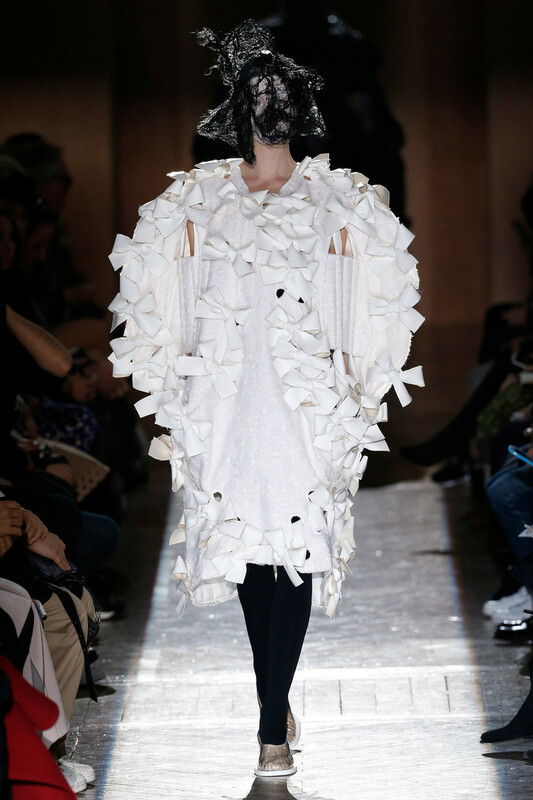 But Kawakubo showed more familiar work too: she took a trenchcoat, for instance, and shredded and balled it into something. 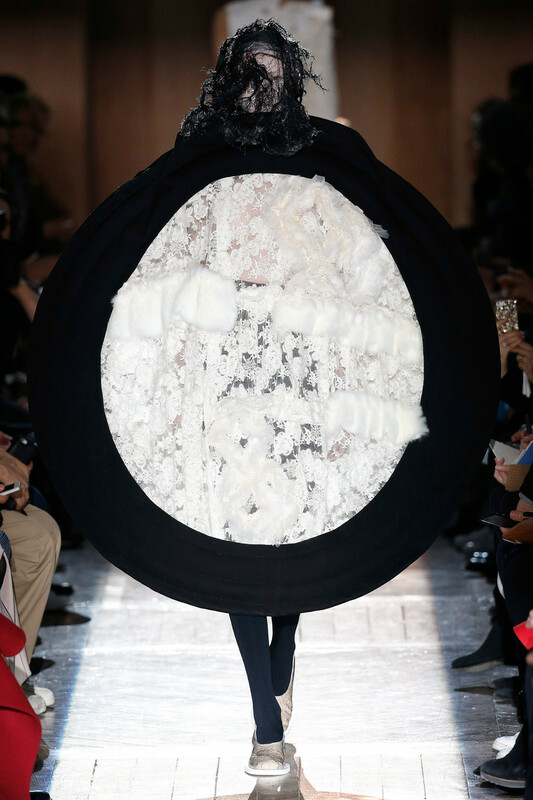 There were the fuzzy circles on jackets, brocades, cutaway jackets, and the asymmetry. 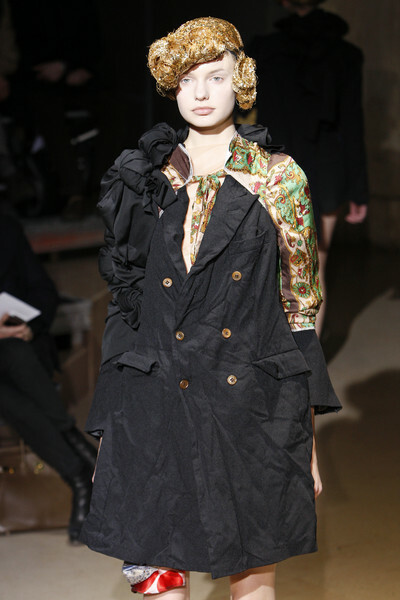 There was also a whole passage of dresses ruched and draped from vintage silk scarves that the designer herself has collected over the years. 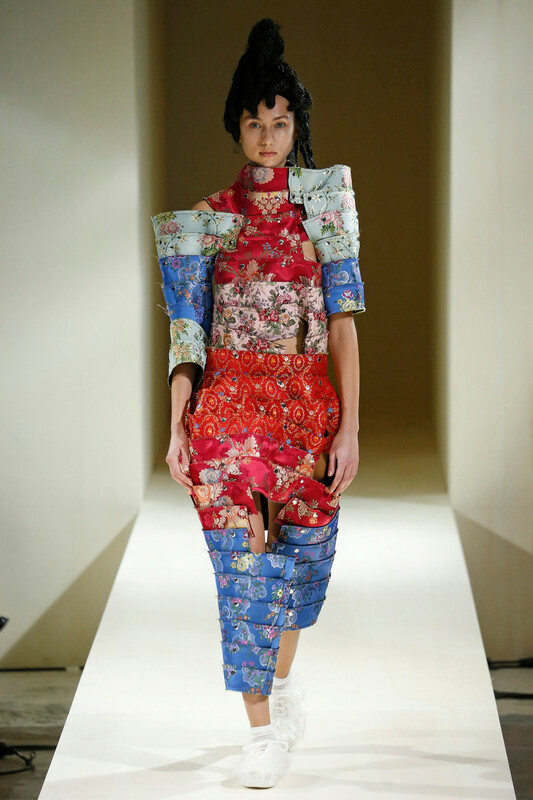 This was a show to remember, certainly for her fans and everybody who seeks new creativity in fashion. 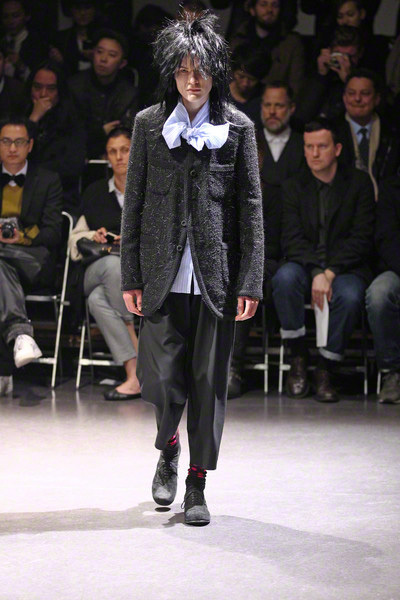 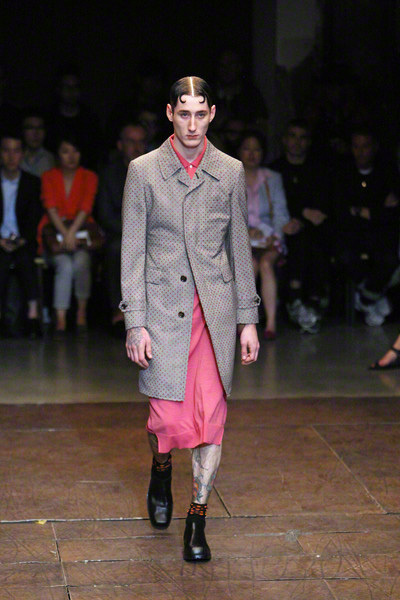 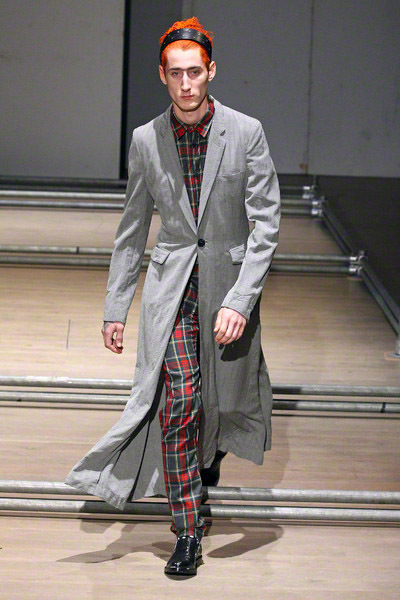 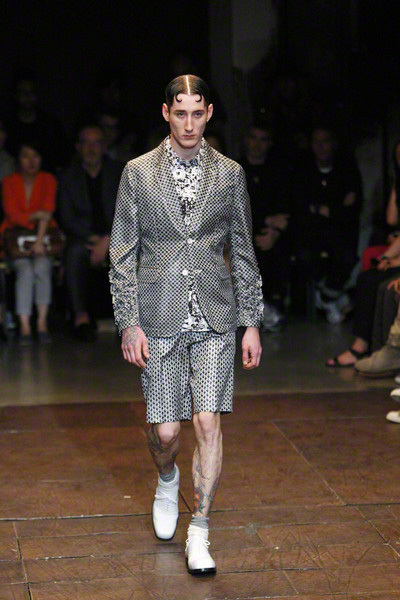 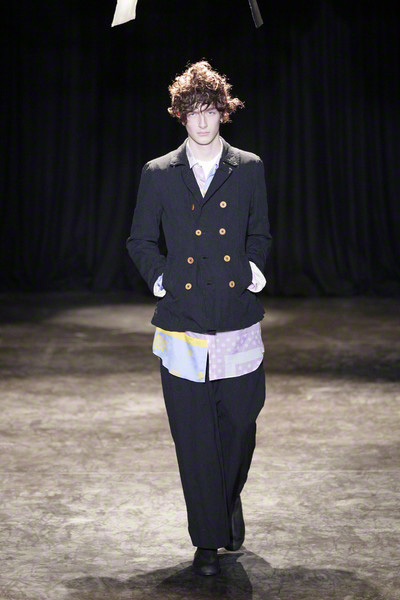 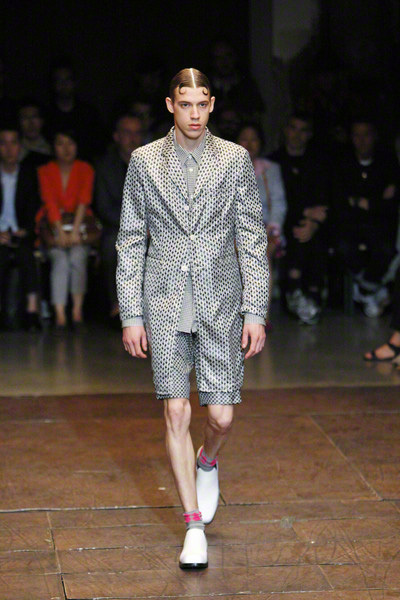 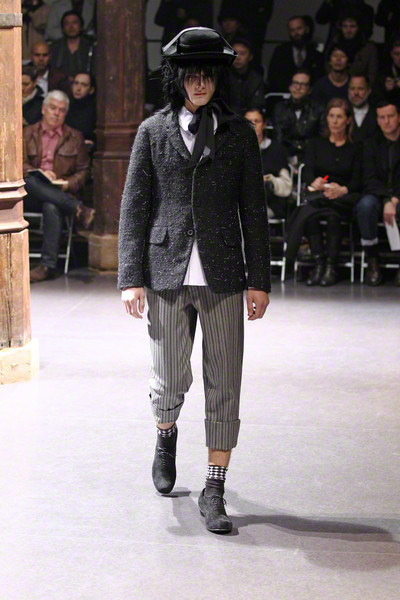 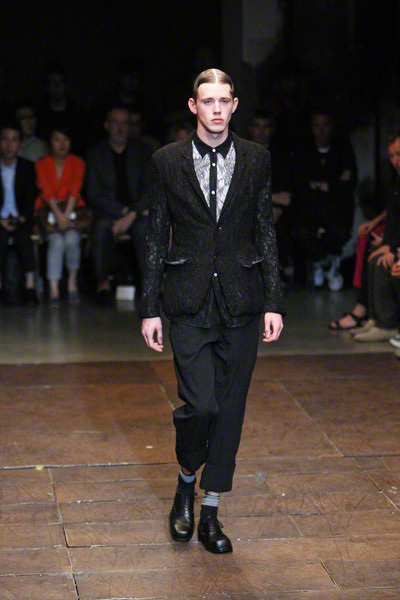 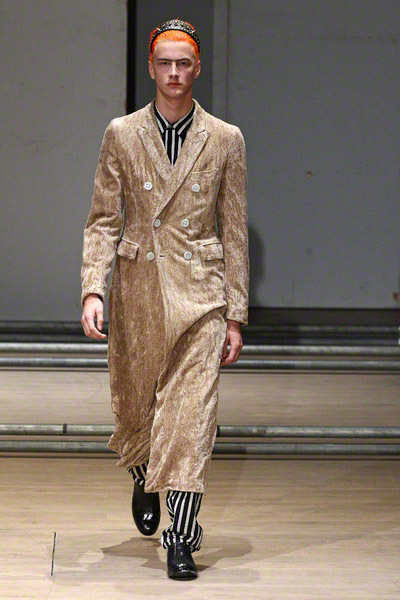 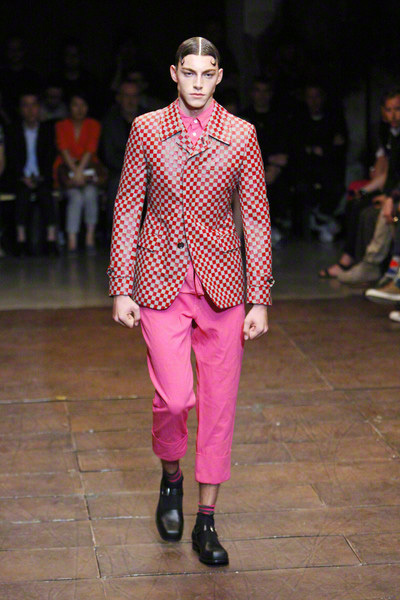 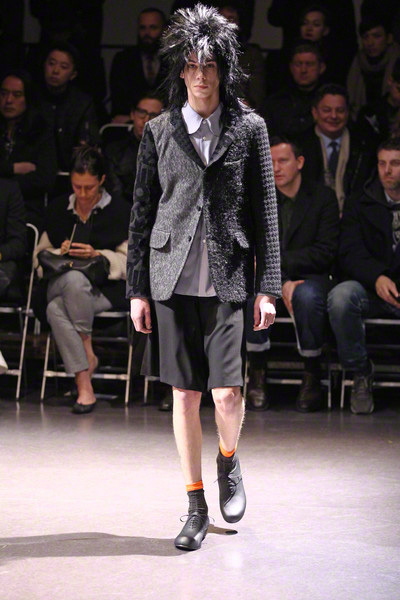 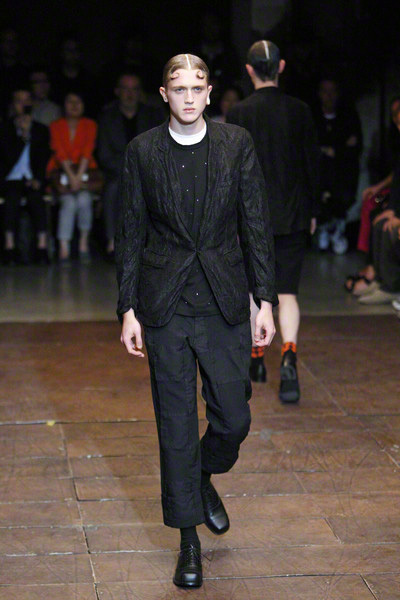 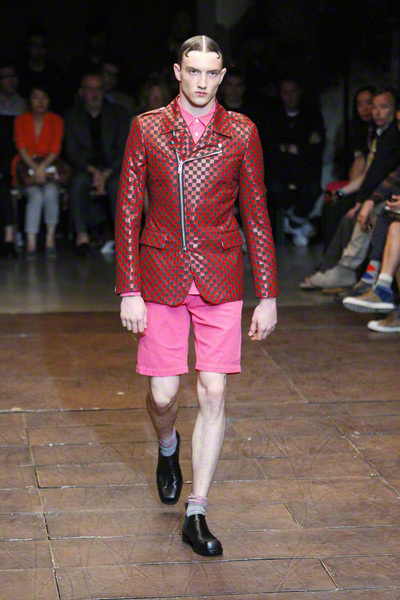 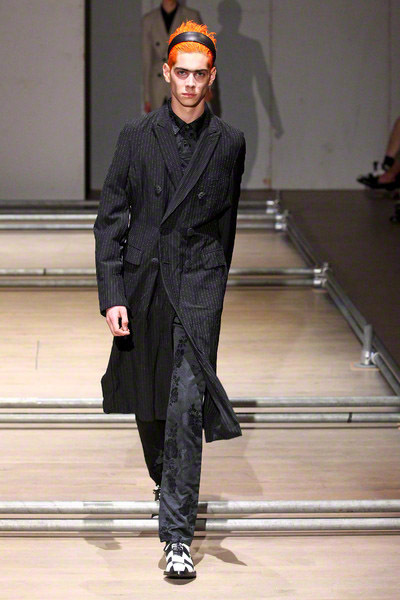 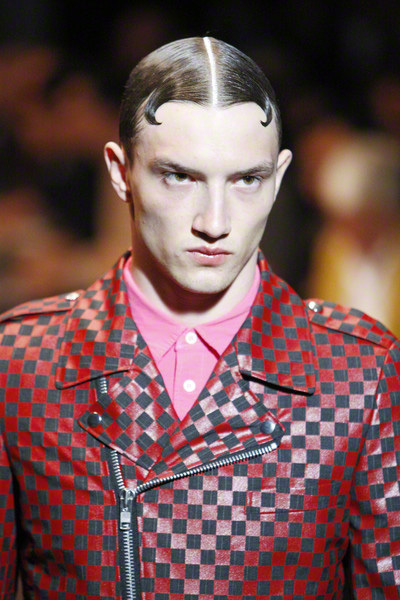 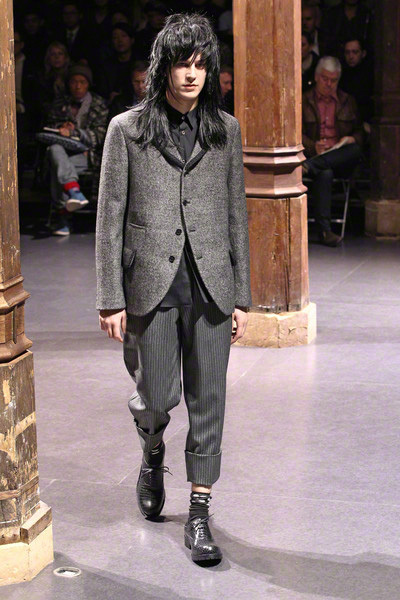 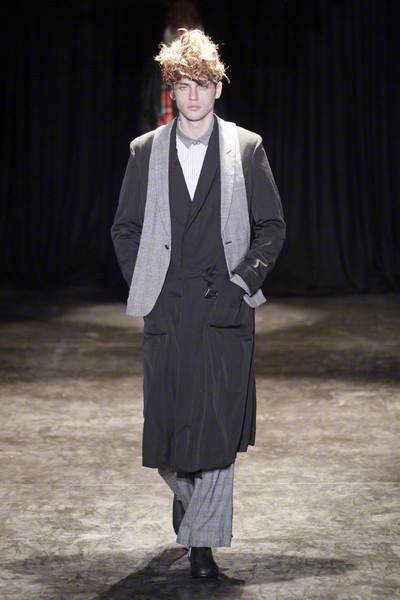 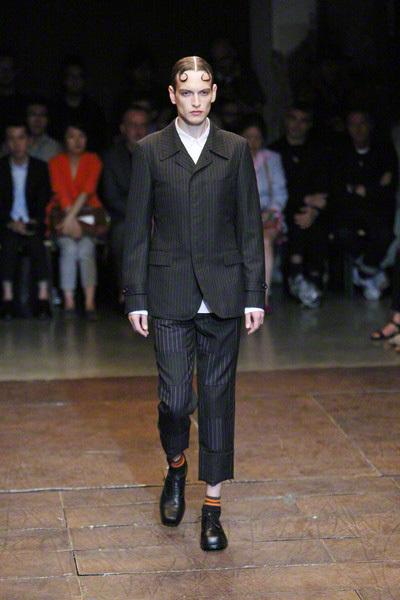 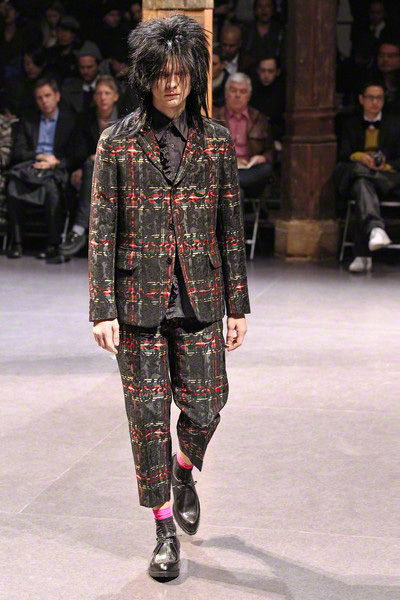 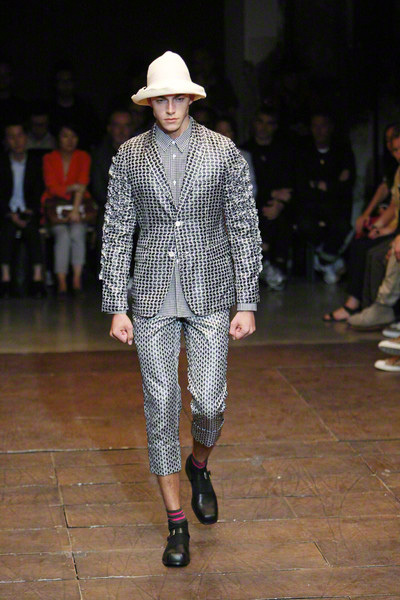 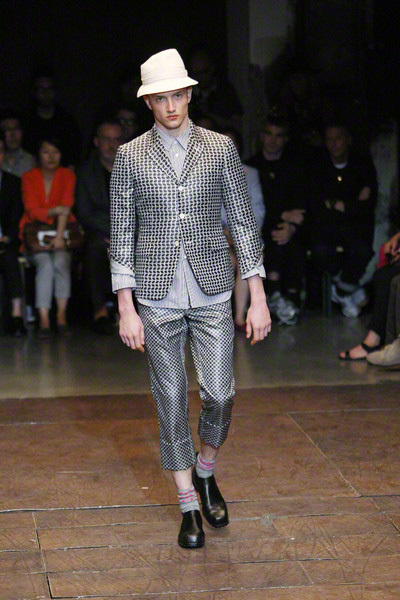 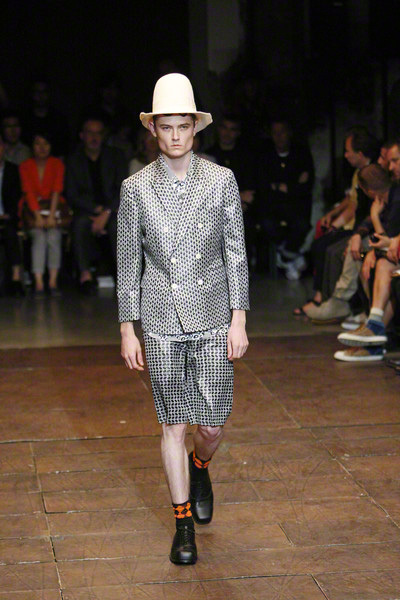 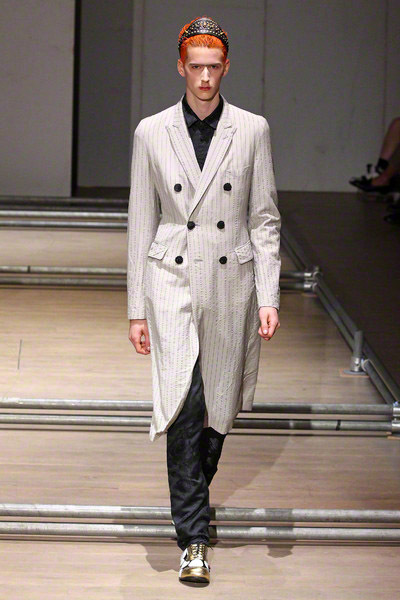 The men’s suit played a major part in the collection of Comme des Garcons, even cardigans looked like a well made jacket. 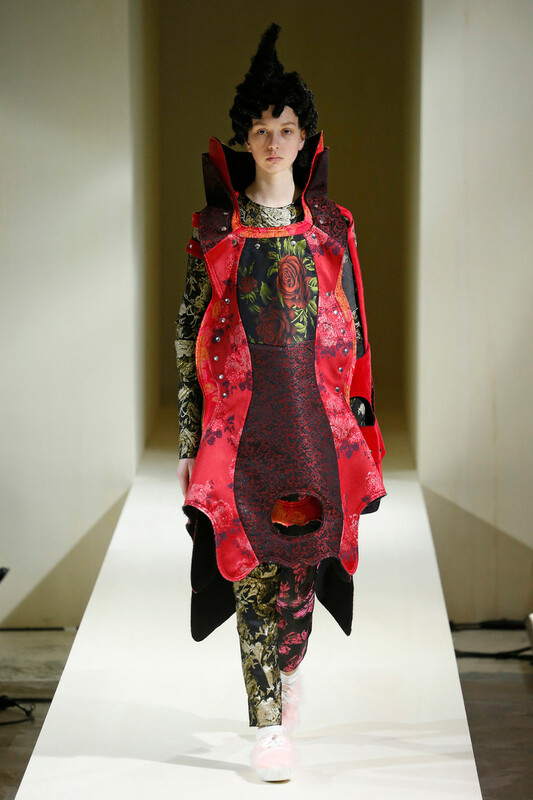 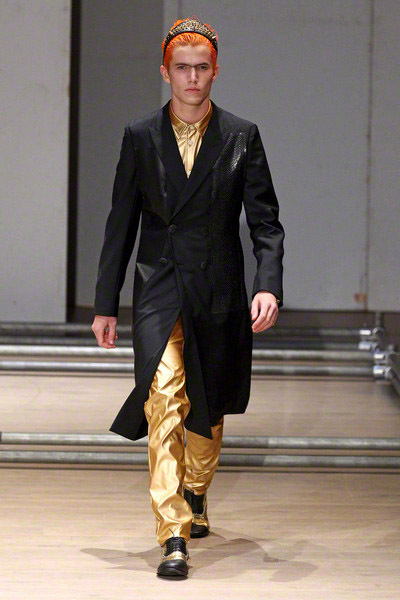 It was actually a very decadent collection compared to other’s we’ve seen of the Japanese label. 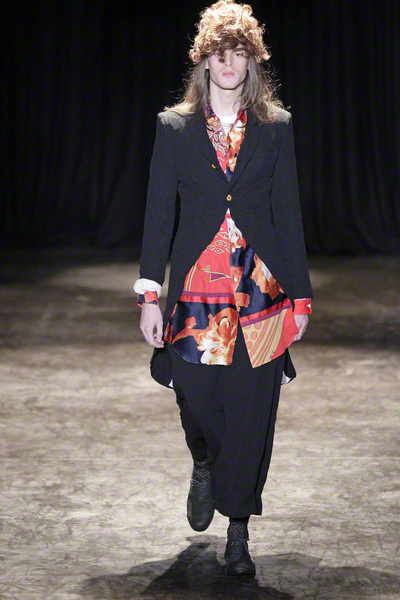 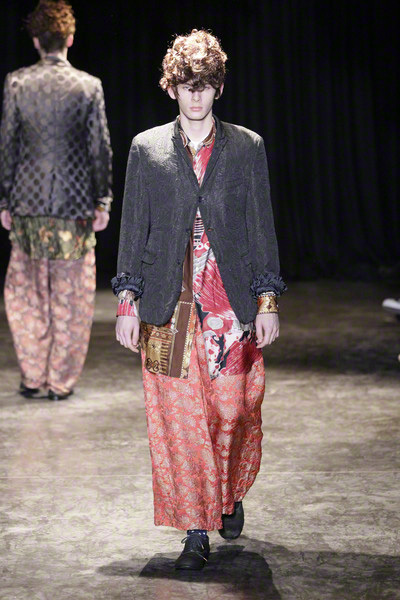 Maybe it was because of the flowing, silk fabrics used for skirts and pants mixed with slim tailoring. 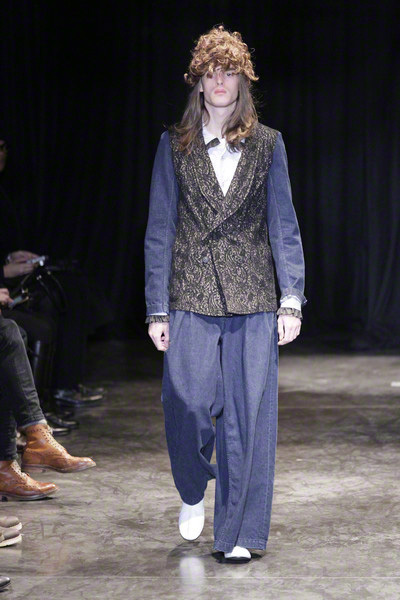 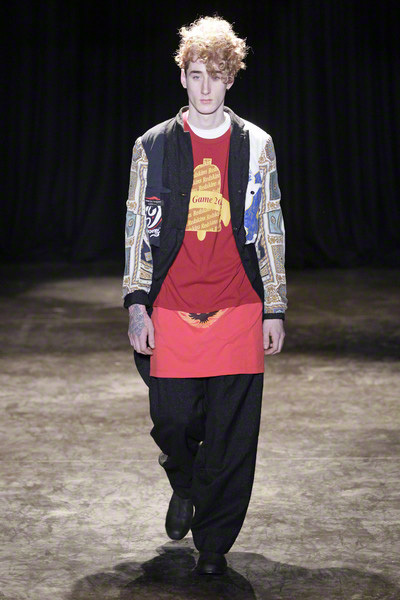 It was a very modern, layered mix of T-shirts, comfy and soft looking jackets and wide pants. 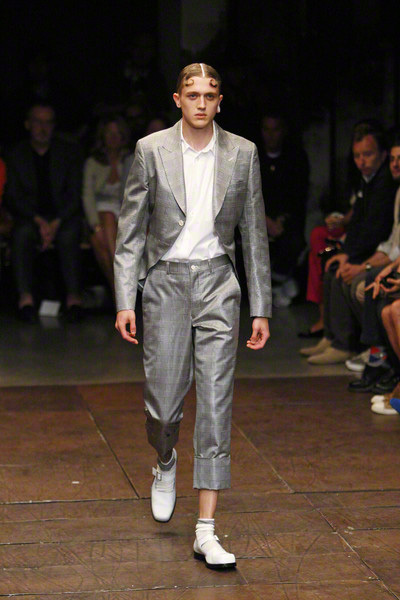 The loose fit is something we have to get used to, after years of slim tailoring. 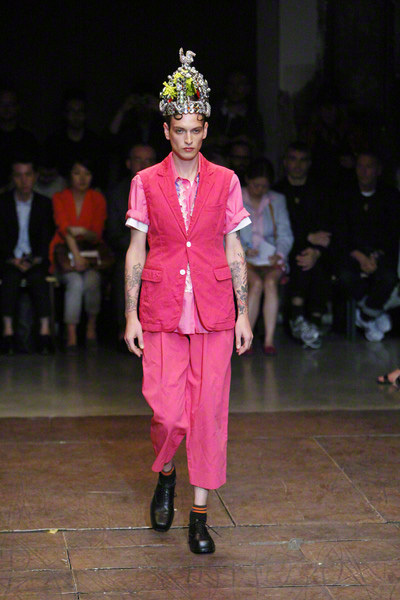 But is all looked relaxed and rich, thanks to the colors and fabrics. 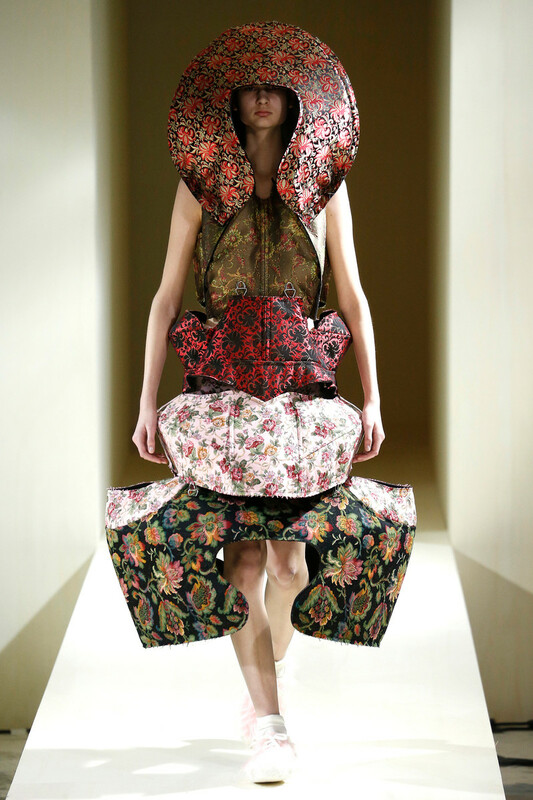 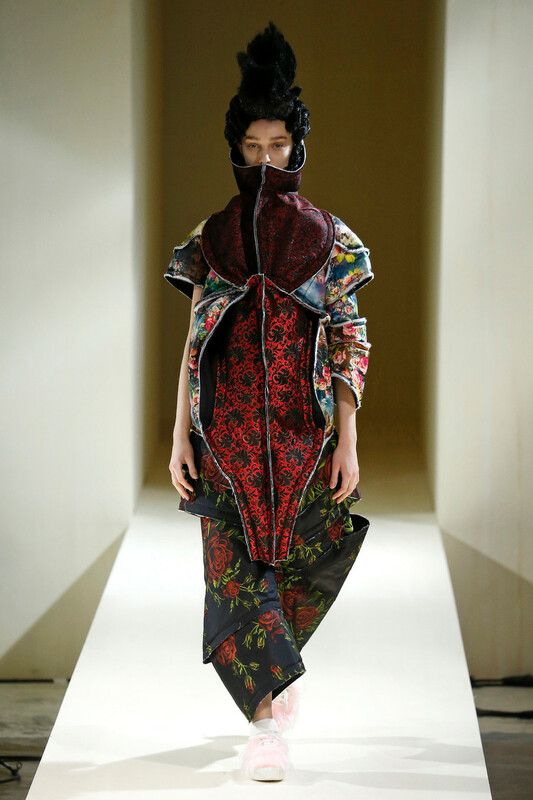 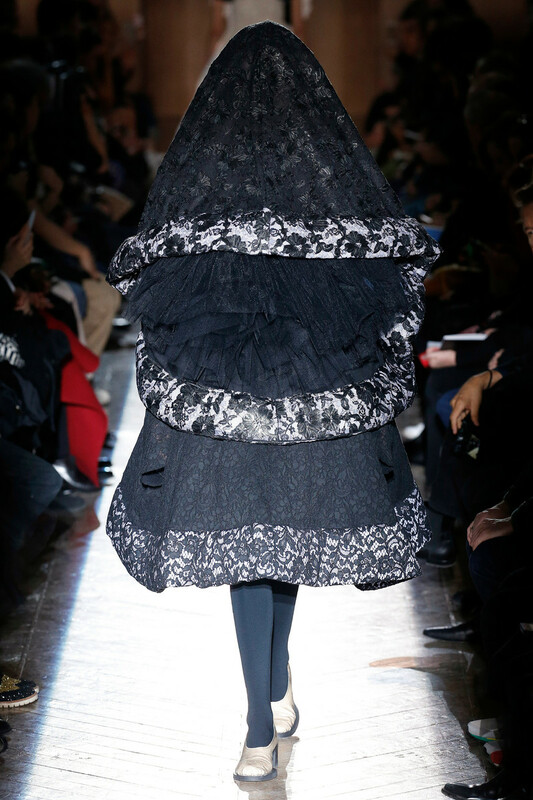 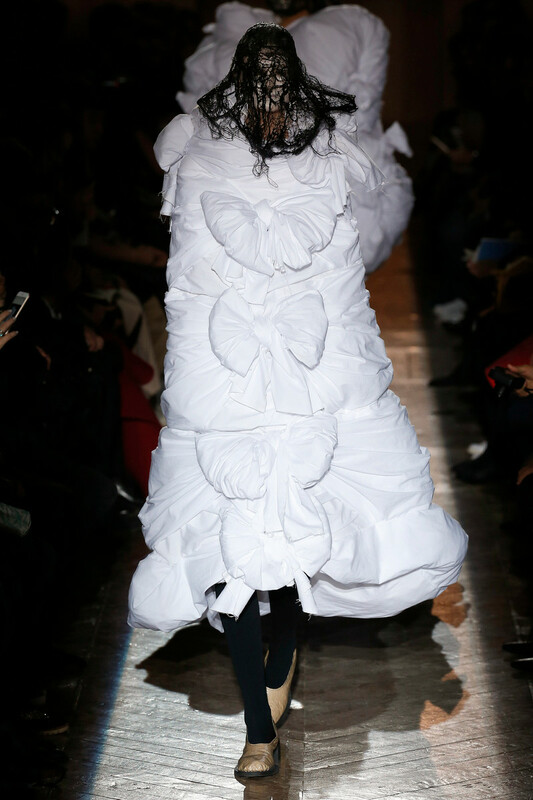 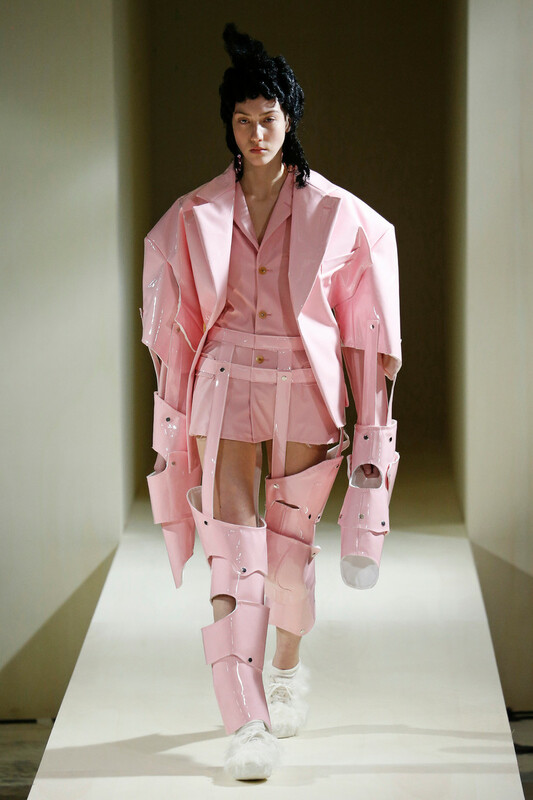 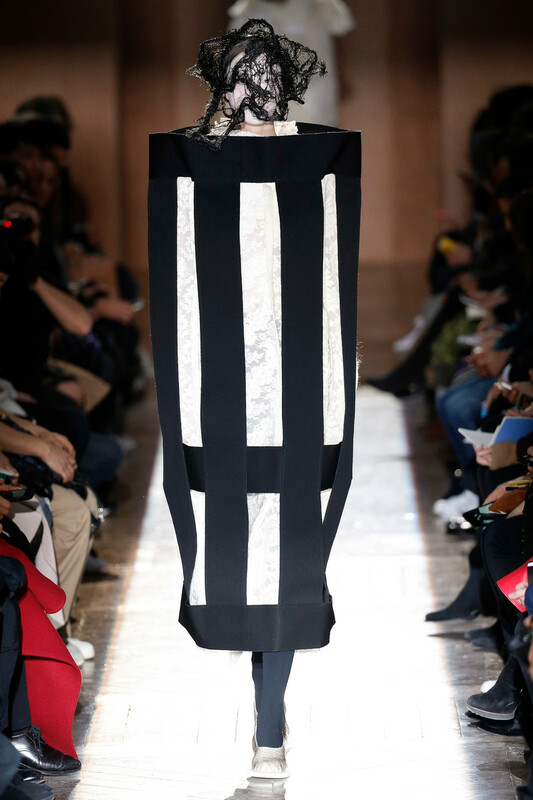 For spring/summer Rei Kawakubo decided to turn her clothes upside down. 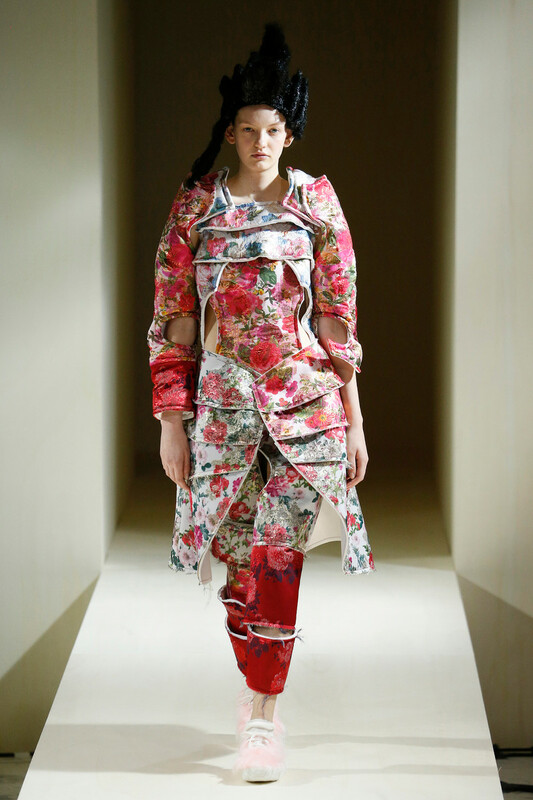 Quite unexpected, yet it turned out alright. 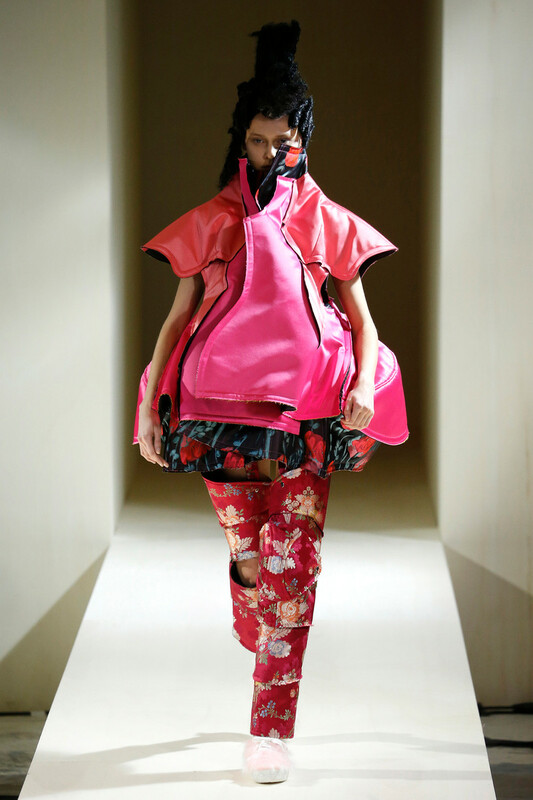 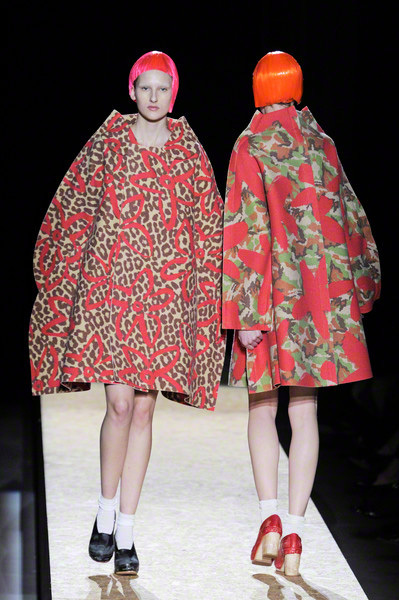 The models wore many different jackets at once, which according to Kawakubo had everything to do with the multiple personalities theme of the show. 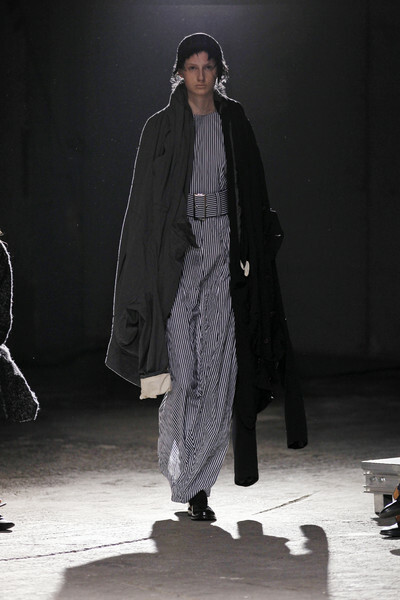 Jackets and coats in black, grey and white were the key items of the show. 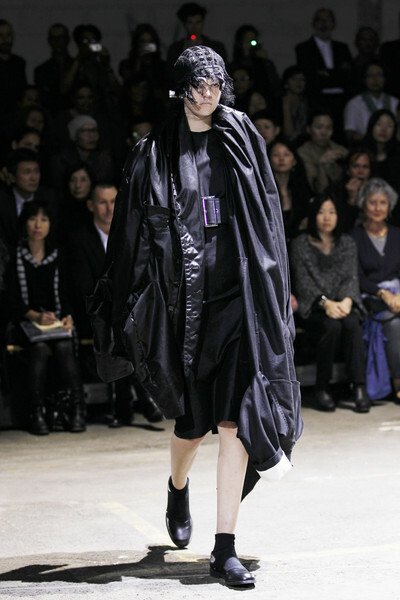 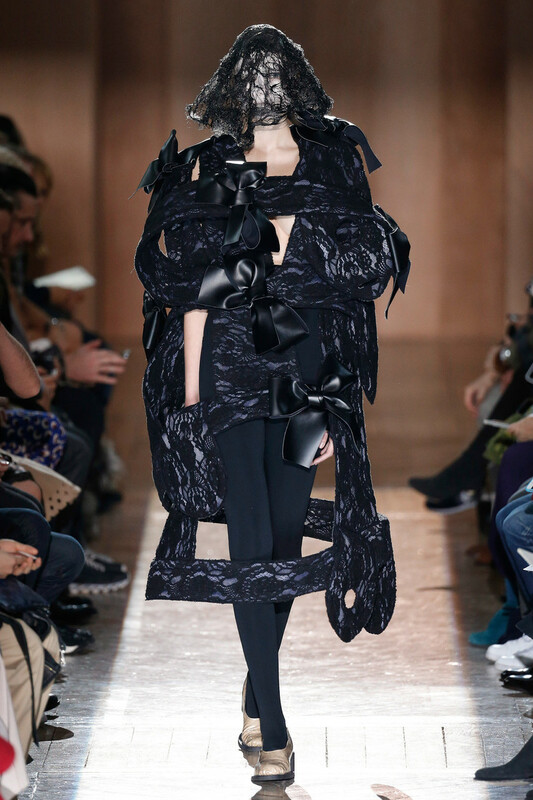 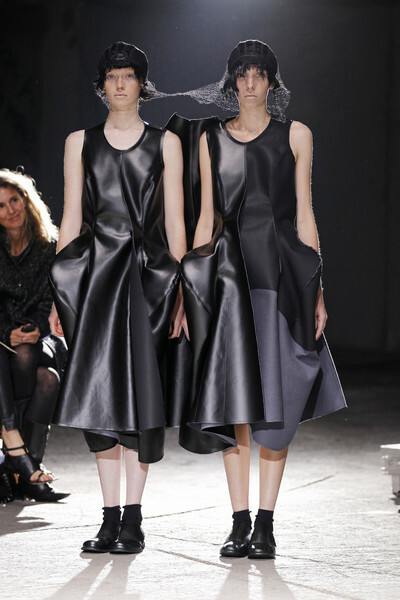 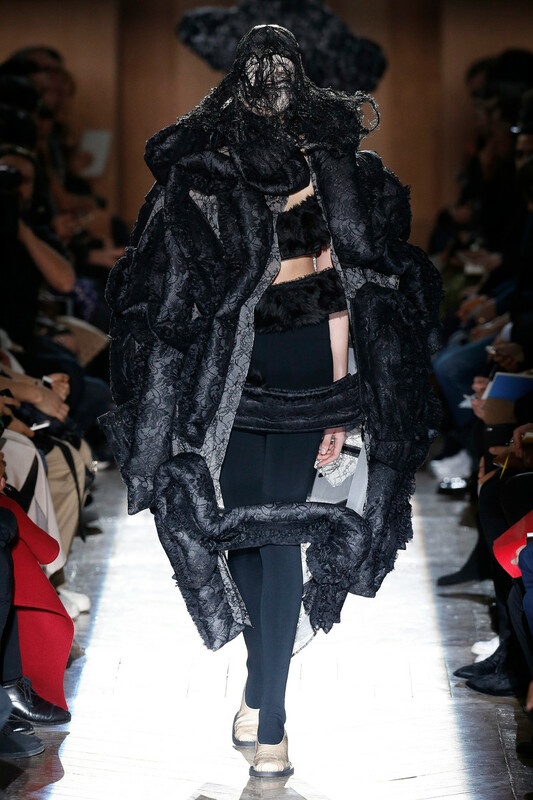 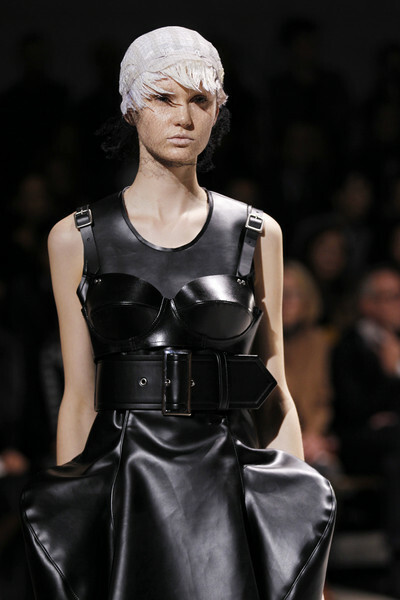 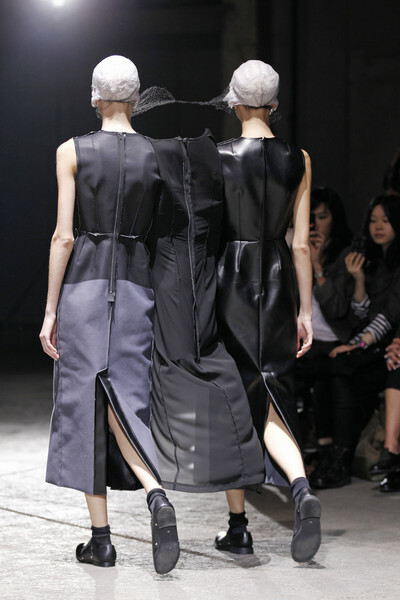 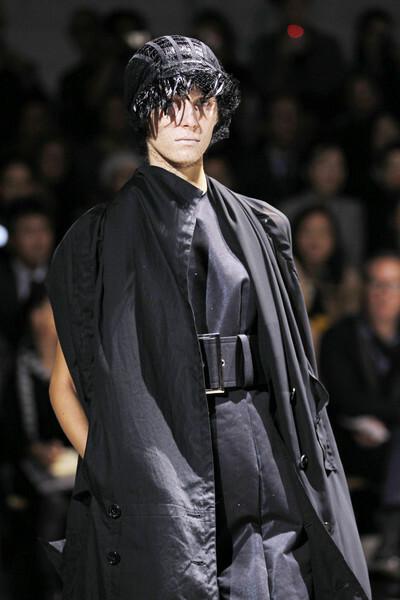 Kawakubo used lots of black leather and added corset-details, hair nets and multiple belts to her looks. 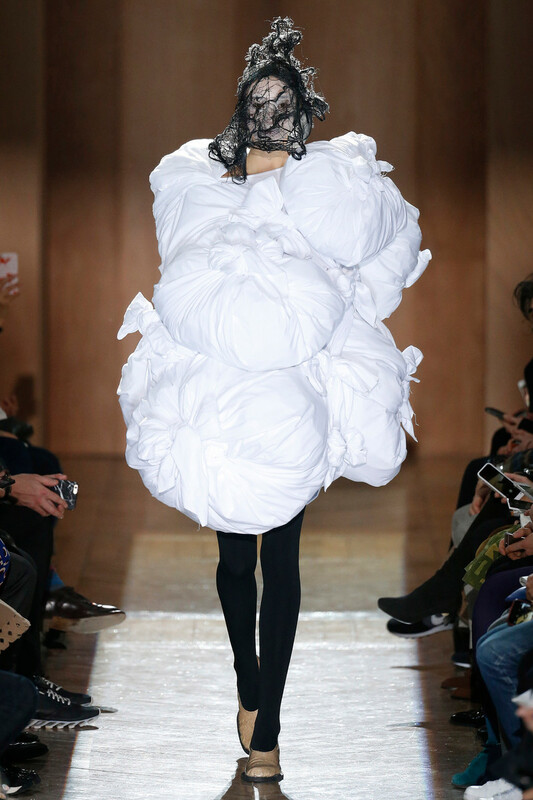 Some models carried so many clothes at least three models could be dressed in them. 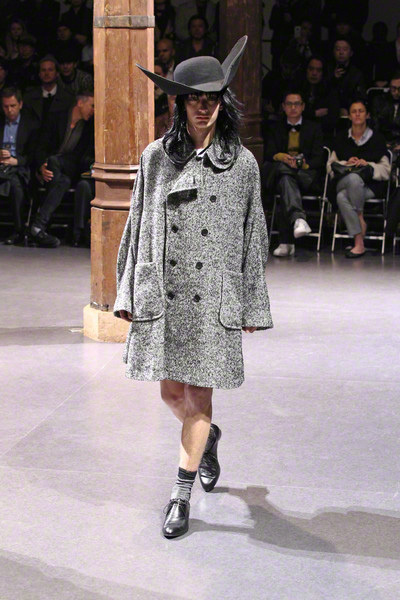 And at the end of the show pairs of models were dressed in clothes which actcually left room for a third person in the middle. 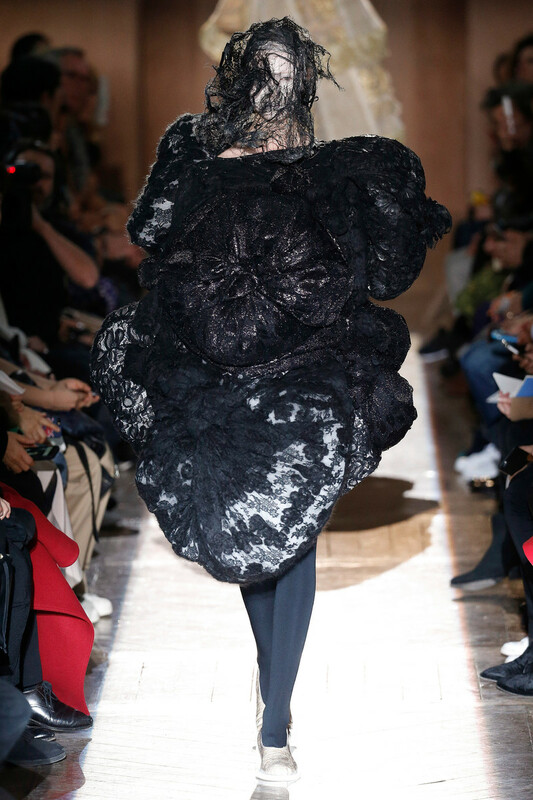 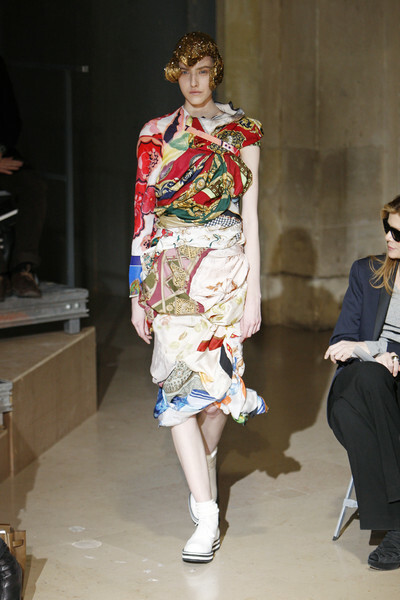 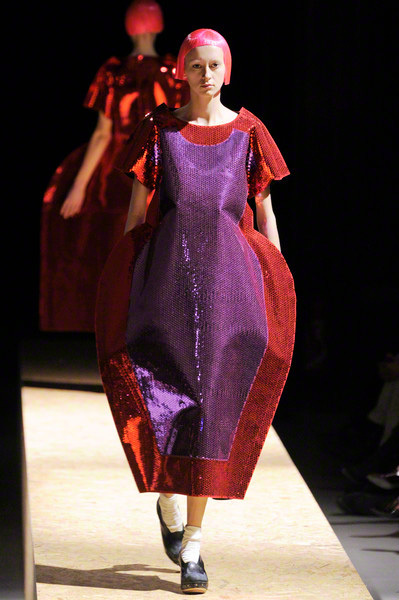 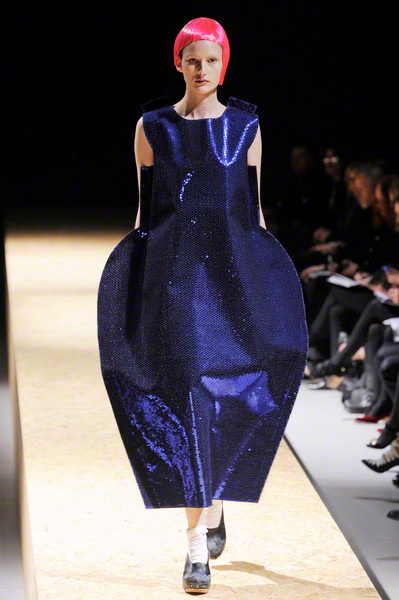 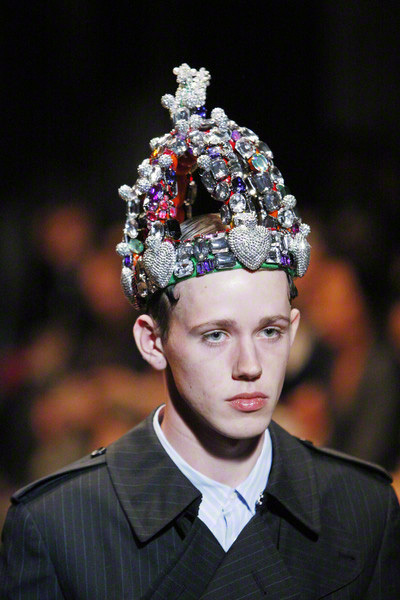 It all was part of Kawakubo’s multiple personality-inspiration. 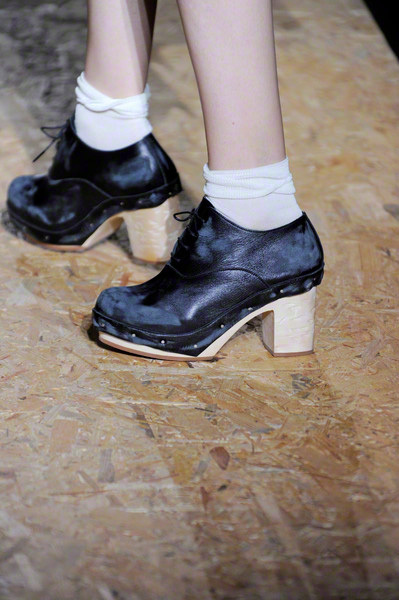 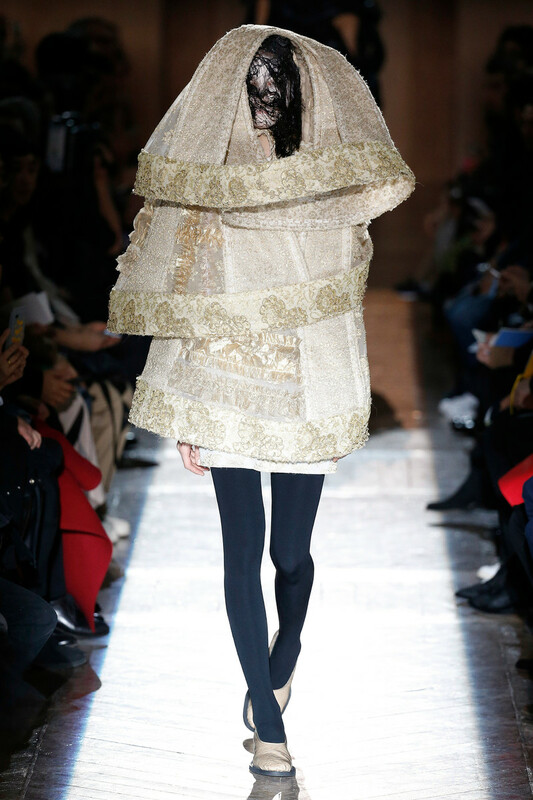 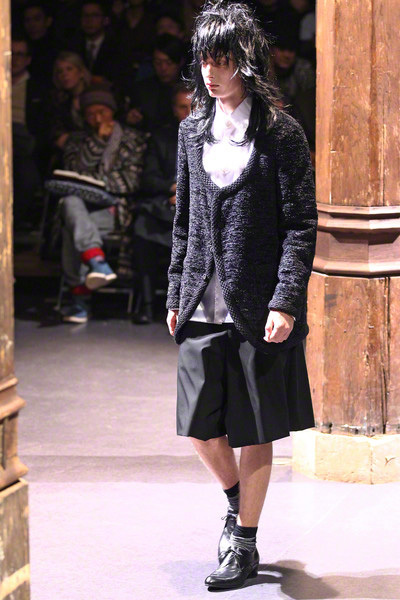 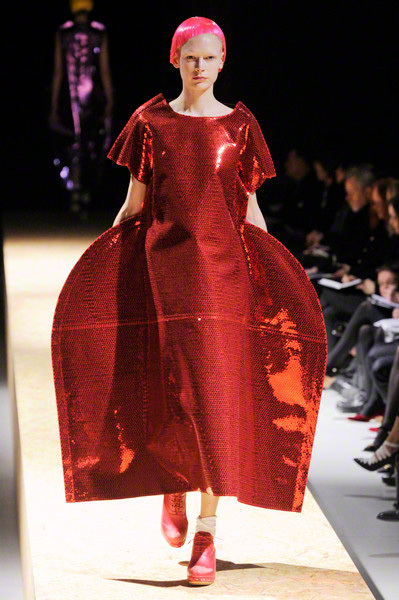 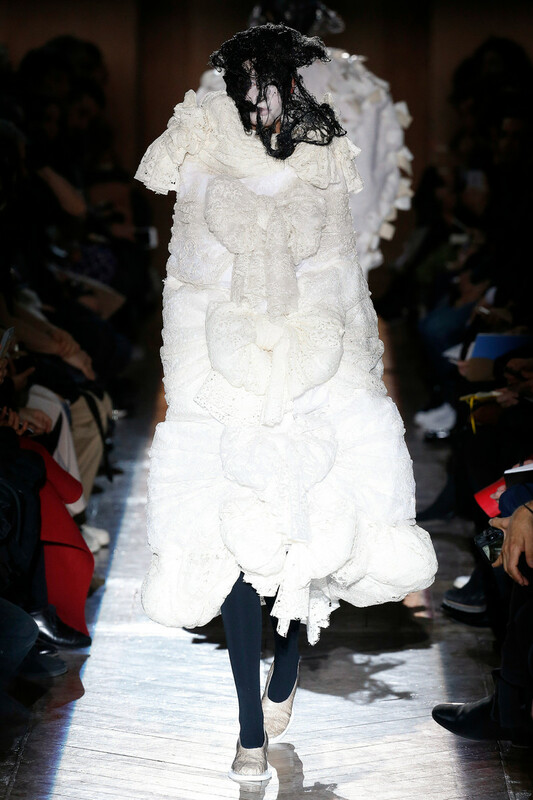 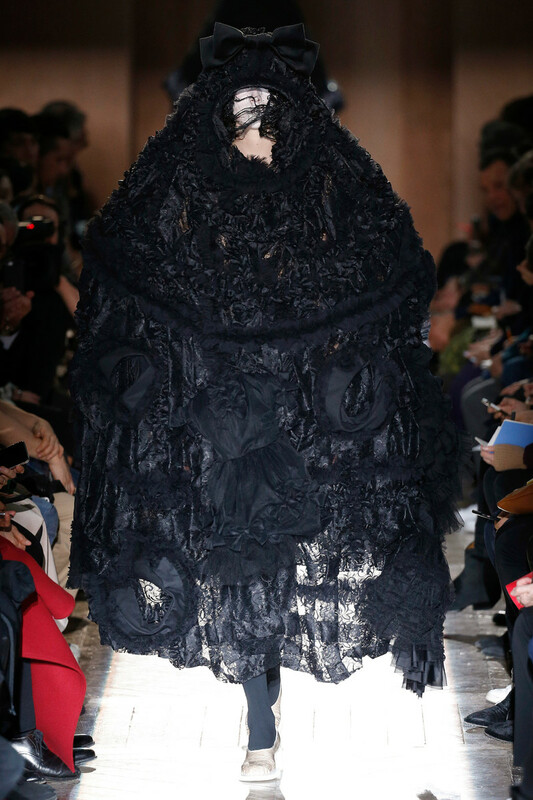 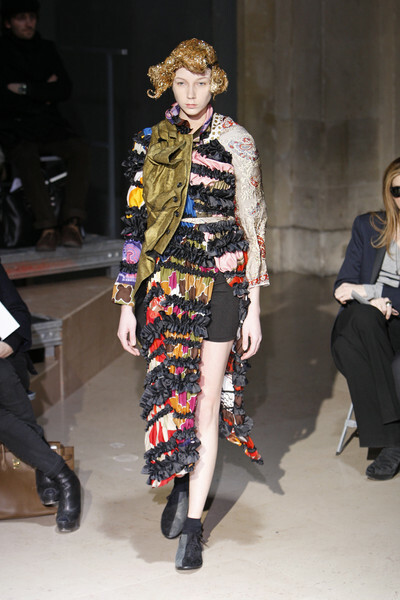 A daring collection, but that’s probably what makes Comme des Garçons such so successful.